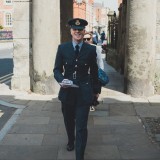 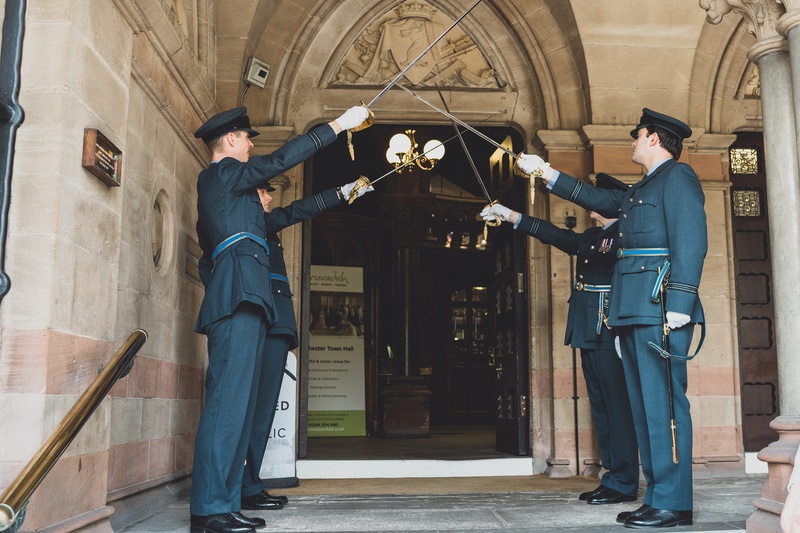 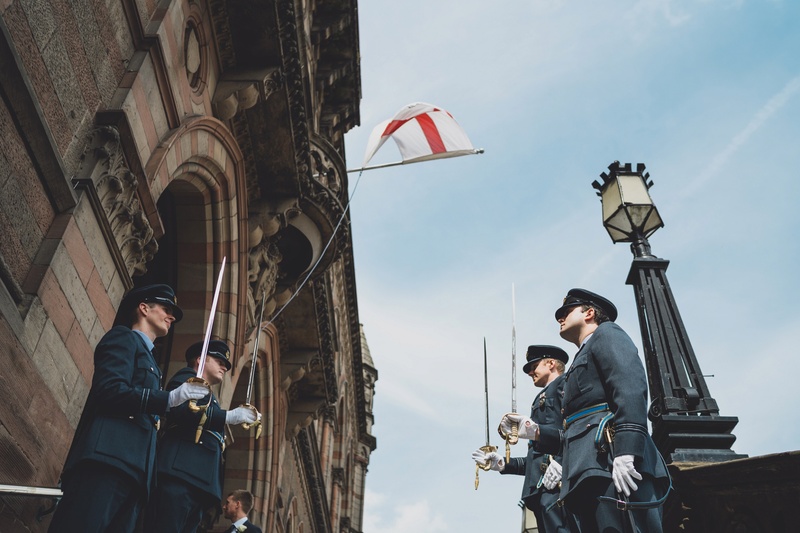 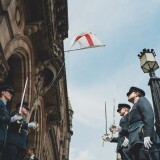 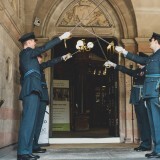 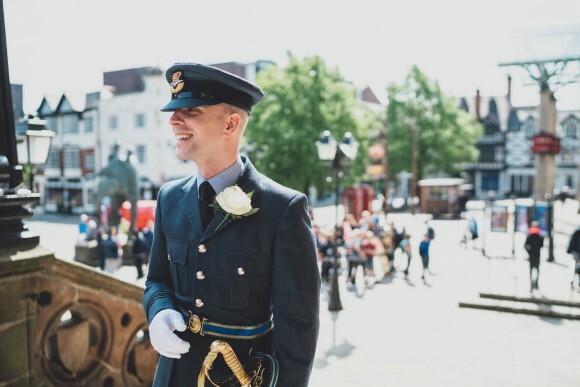 There’s a definite sense of occasion at today’s real wedding between Freya and Daniel, as Daniel dons his RAF uniform and his colleagues unleash their ceremonial swords to welcome the groom to the town hall and add pomp to the procession once the couple are married. 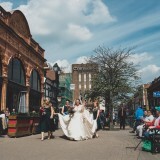 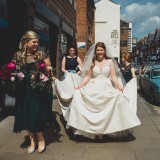 But it’s not just the chaps turning heads on the streets of Chester: as Freya passes the shoppers and bystanders on her way to meet Daniel, she is resplendent in her voluminous gold gown with its plunging neckline, delicate leaf design and the acres of skirt carried by her bridesmaid entourage. 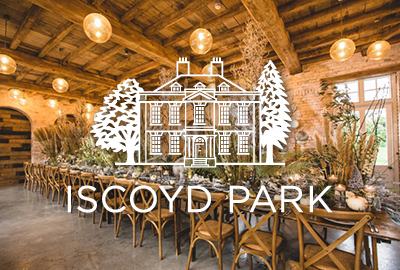 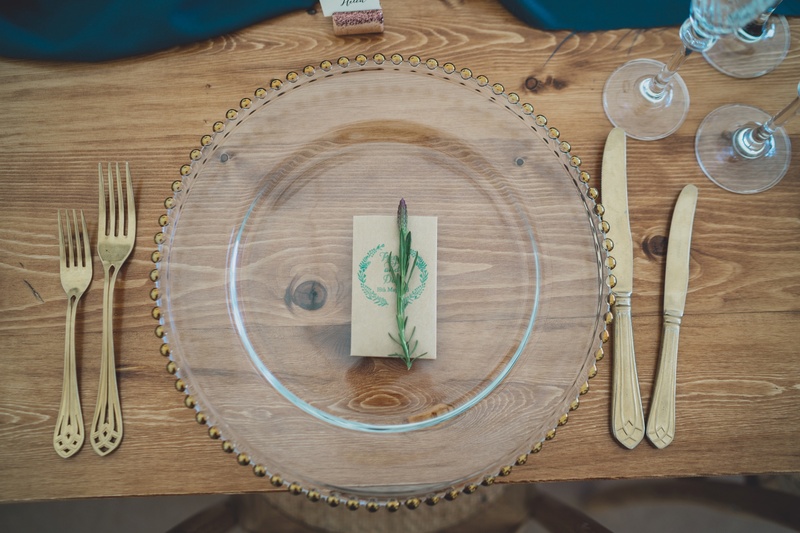 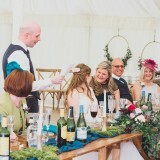 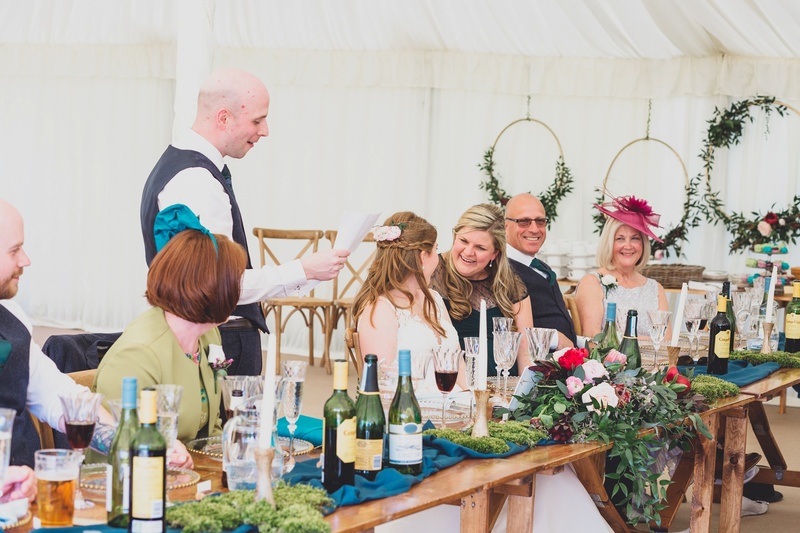 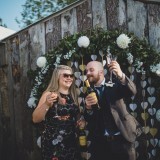 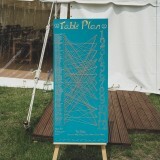 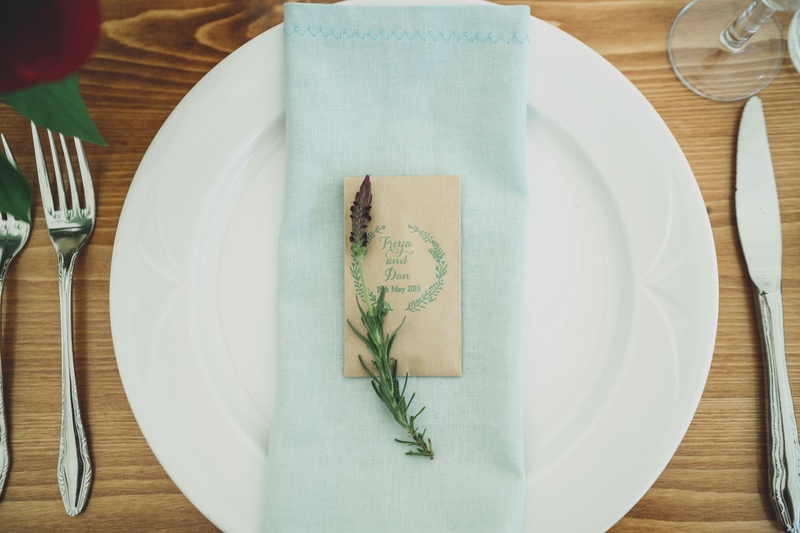 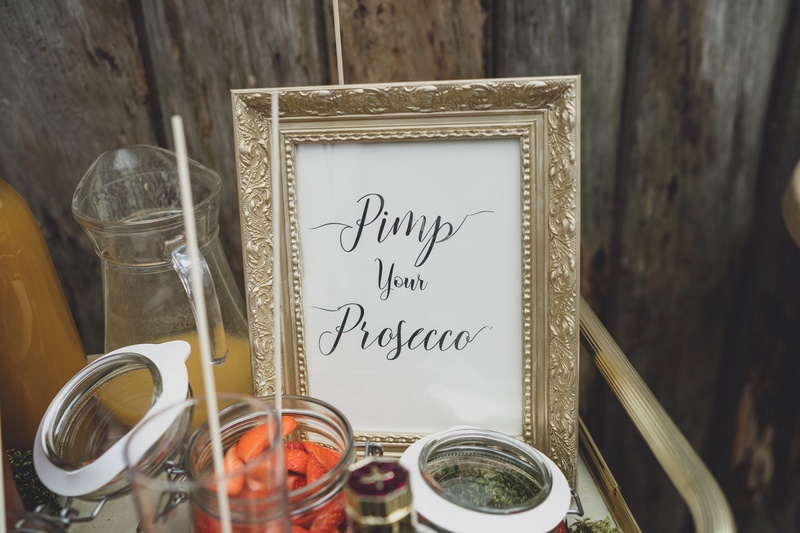 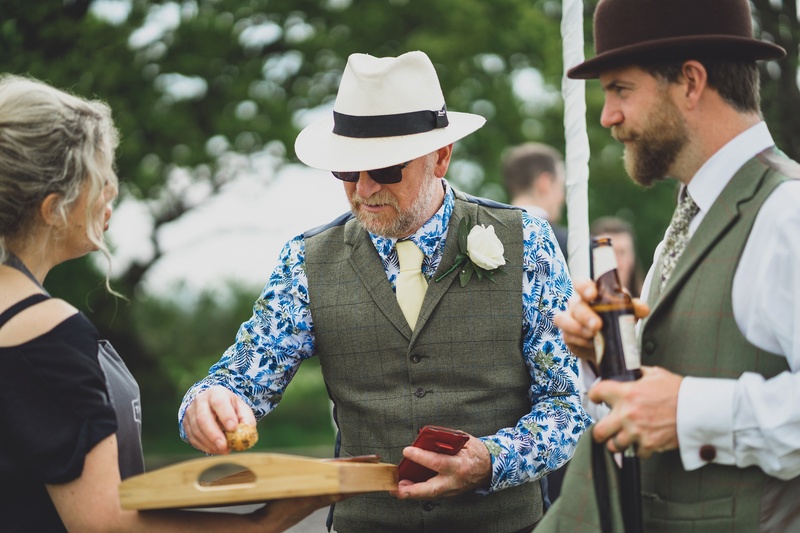 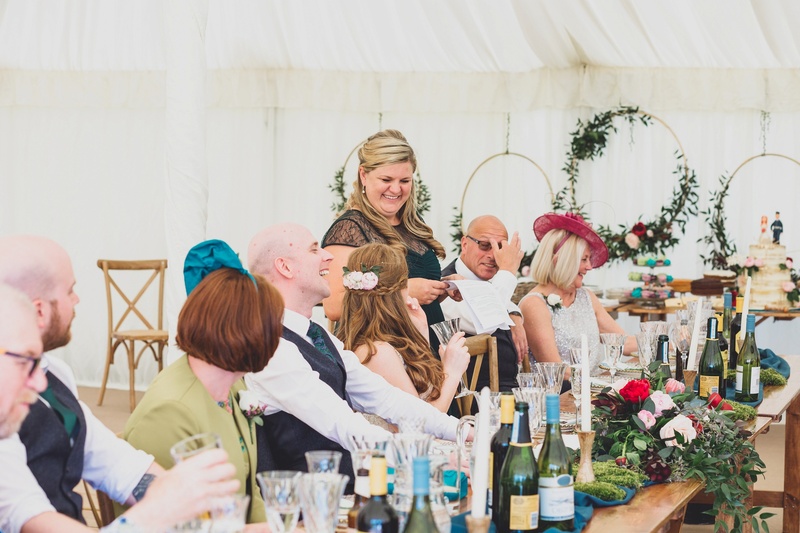 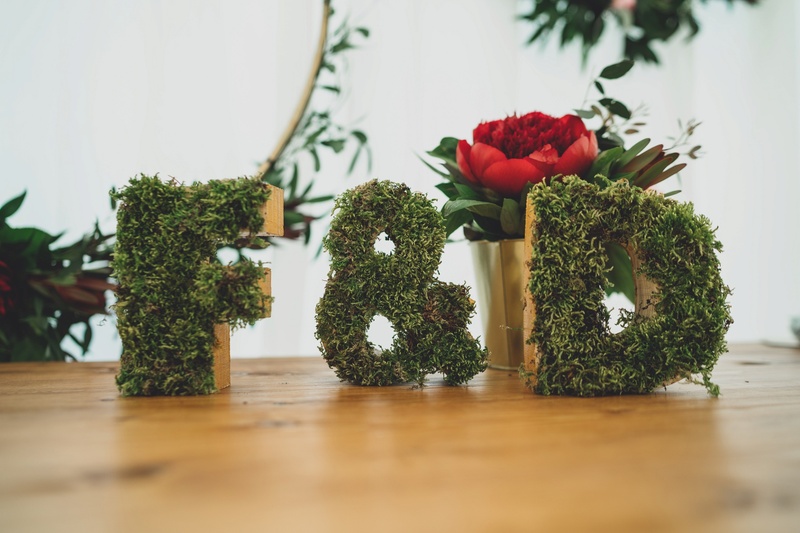 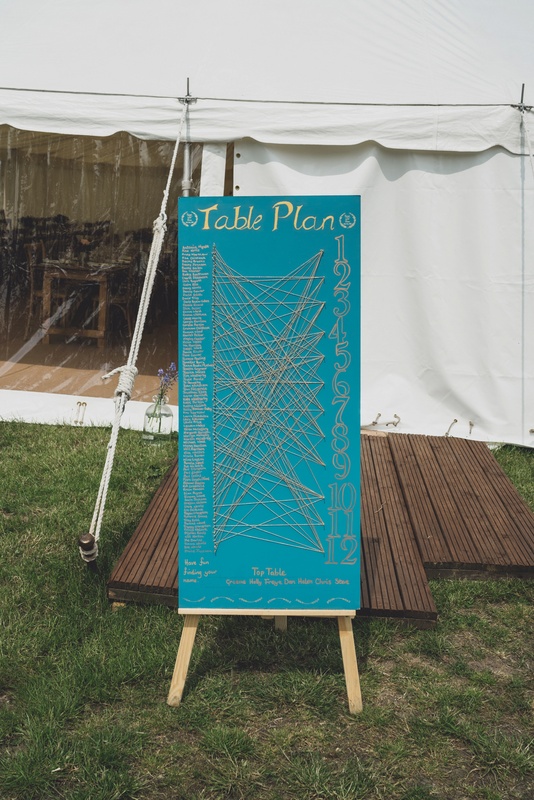 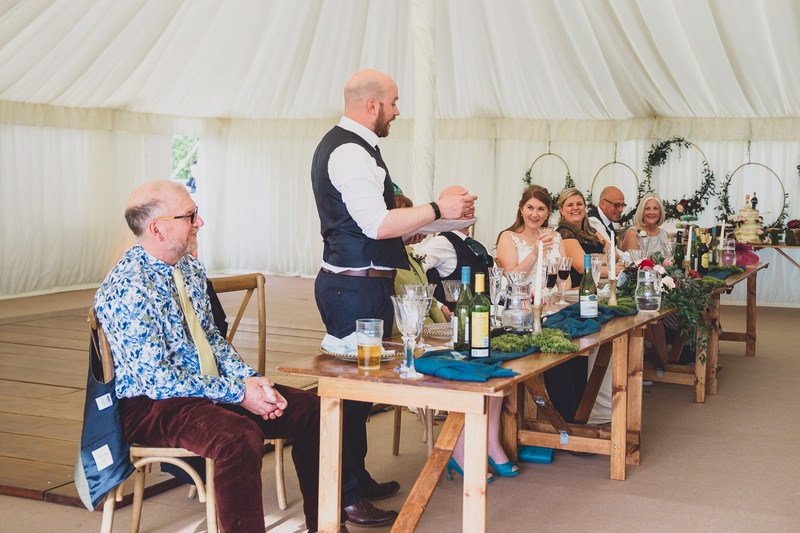 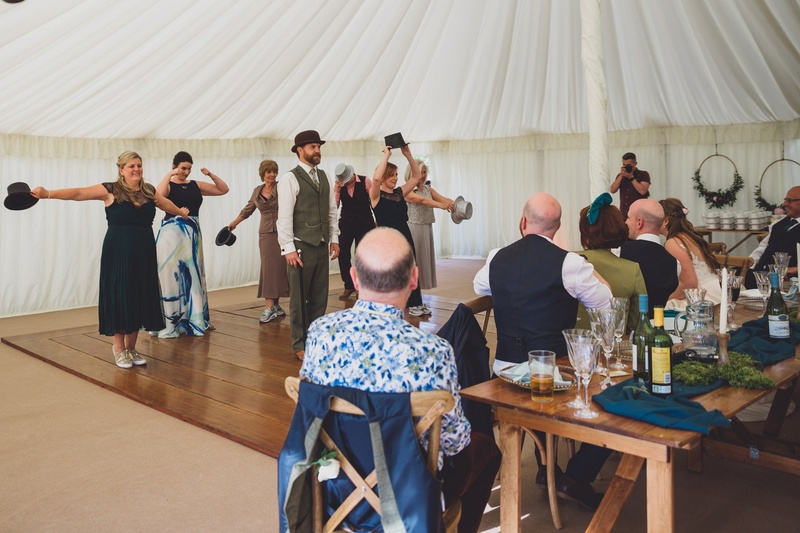 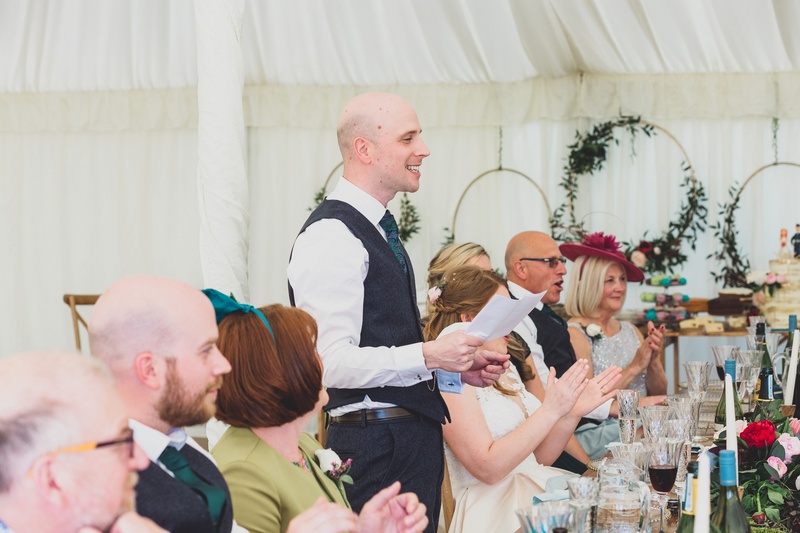 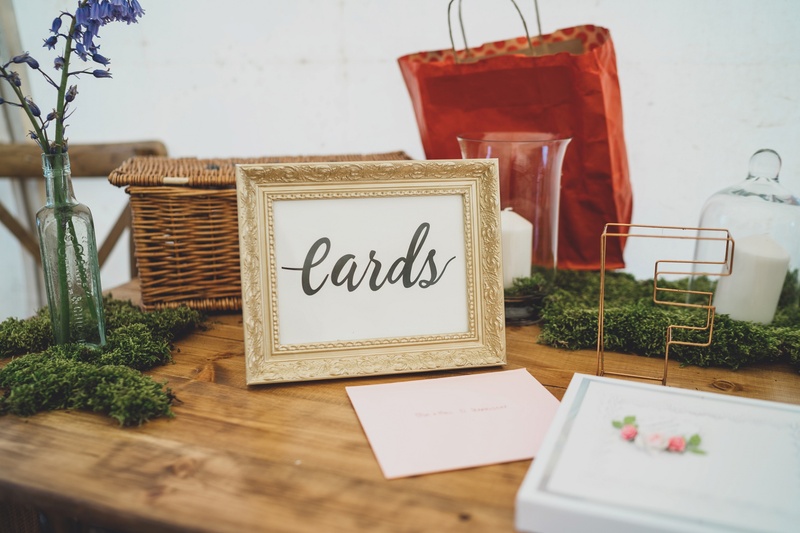 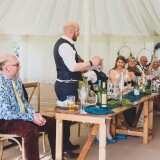 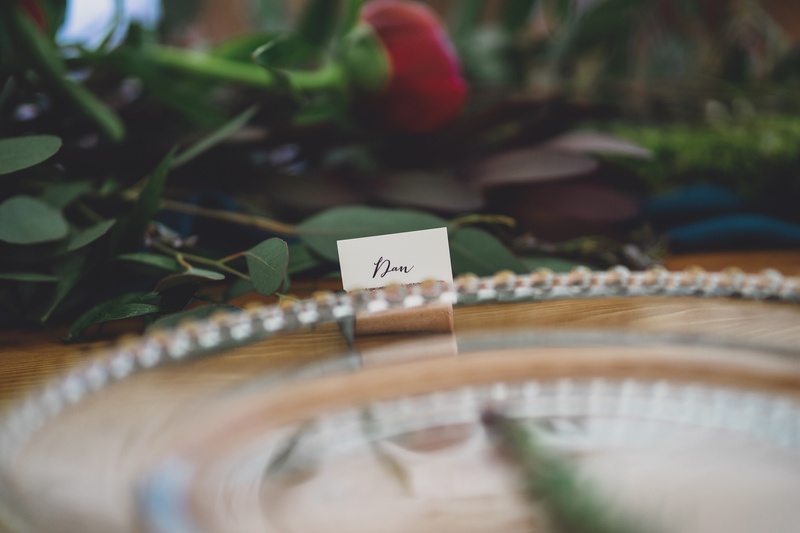 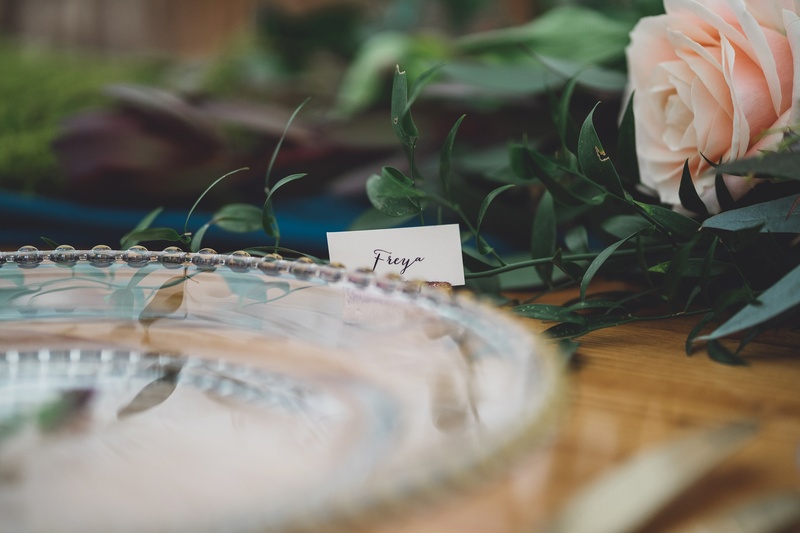 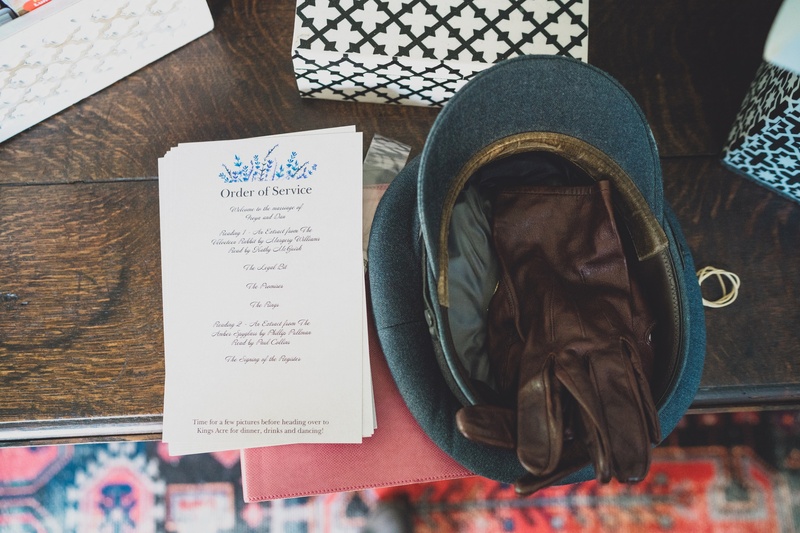 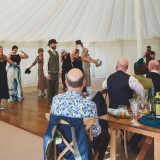 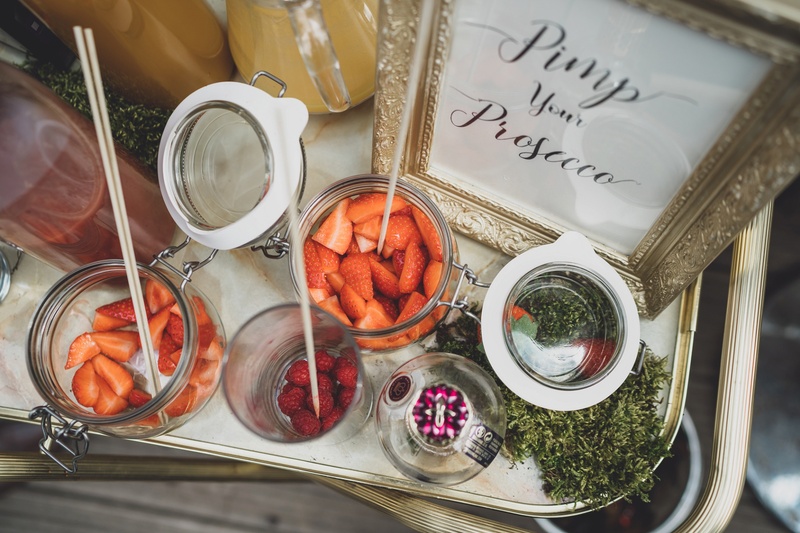 There is possibly the most challenging table plan we’ve ever seen at this wedding, which surely caused guests a few giggles after a couple of glasses of ‘pimp your prosecco’ as they tried to crack the code of where they were to sit! 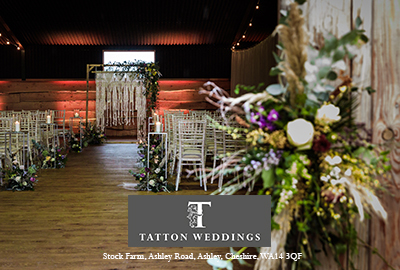 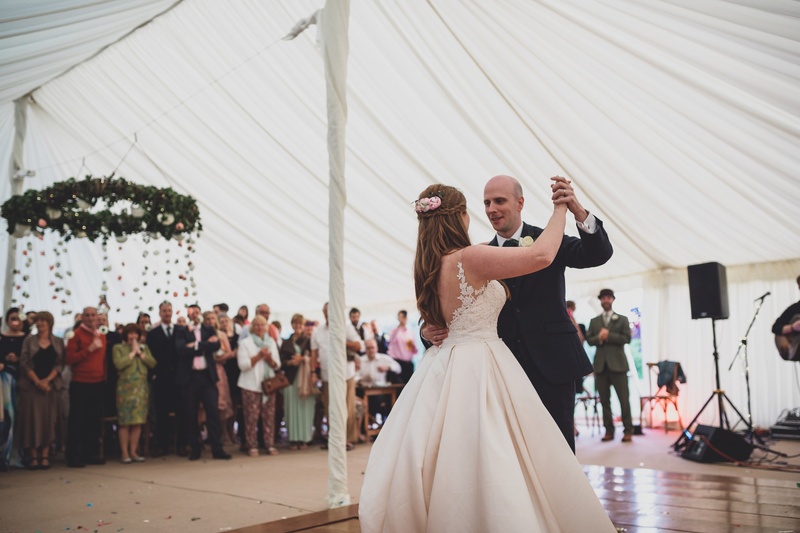 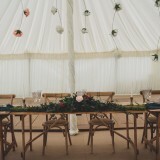 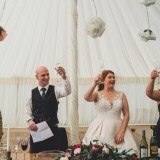 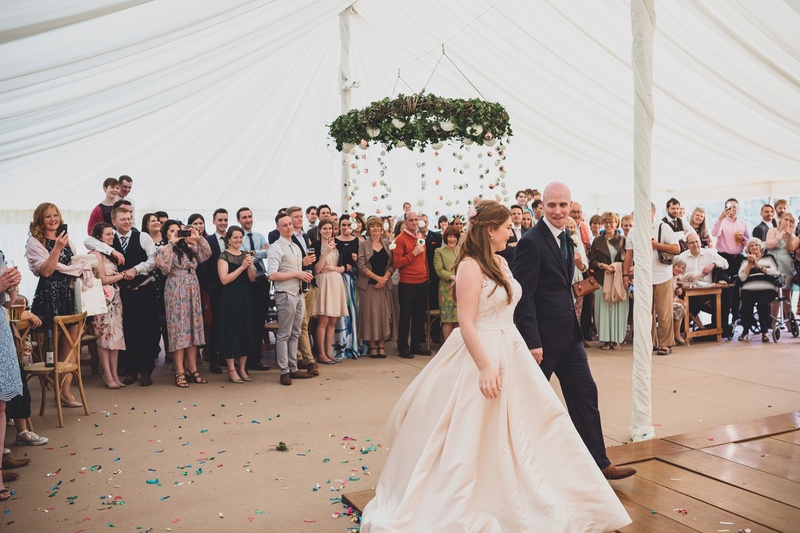 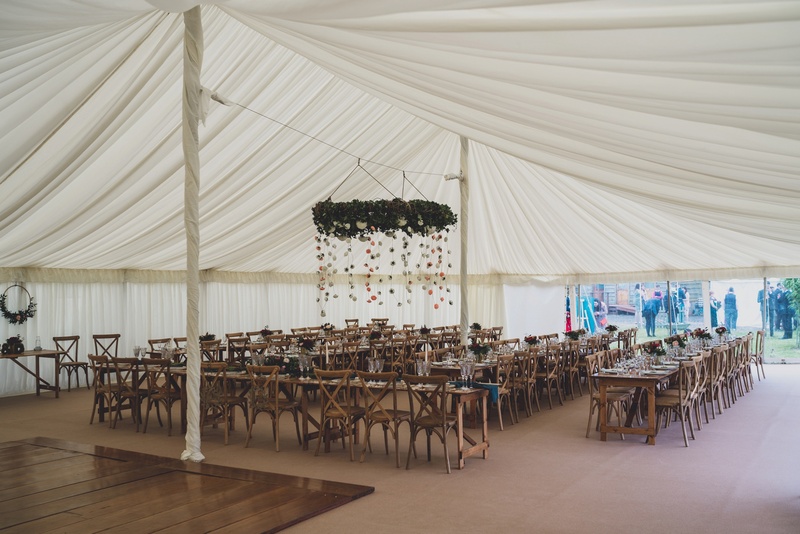 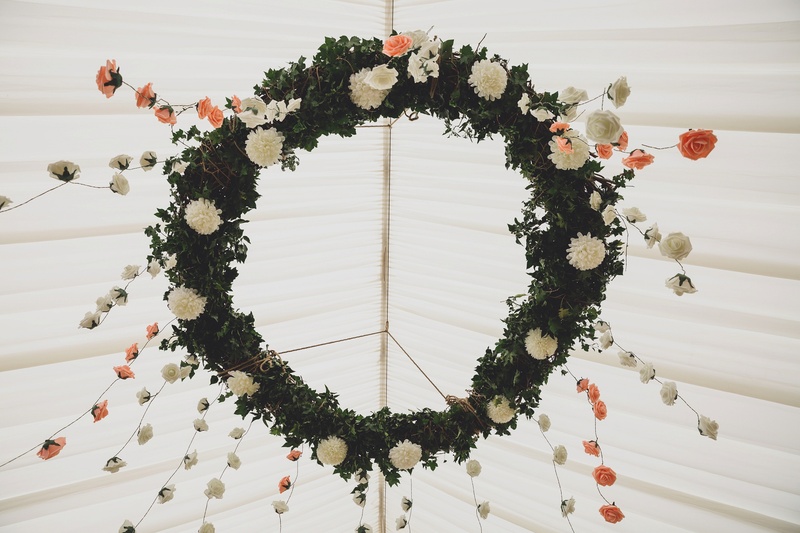 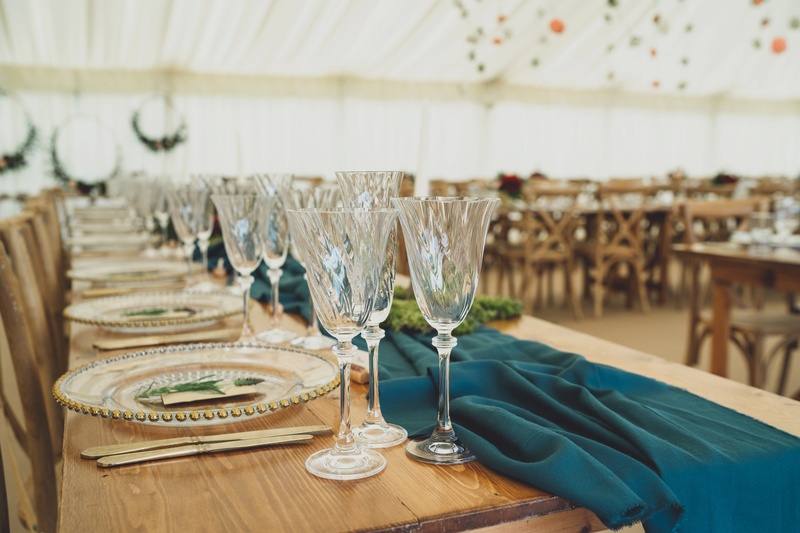 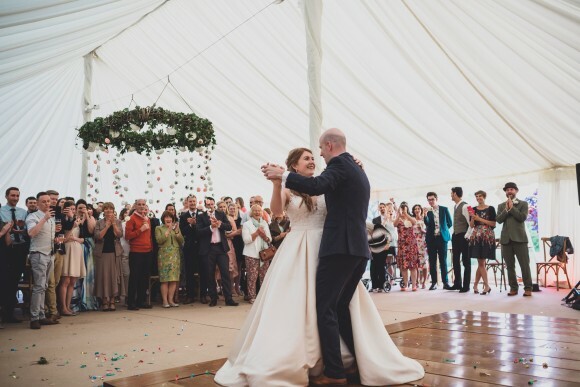 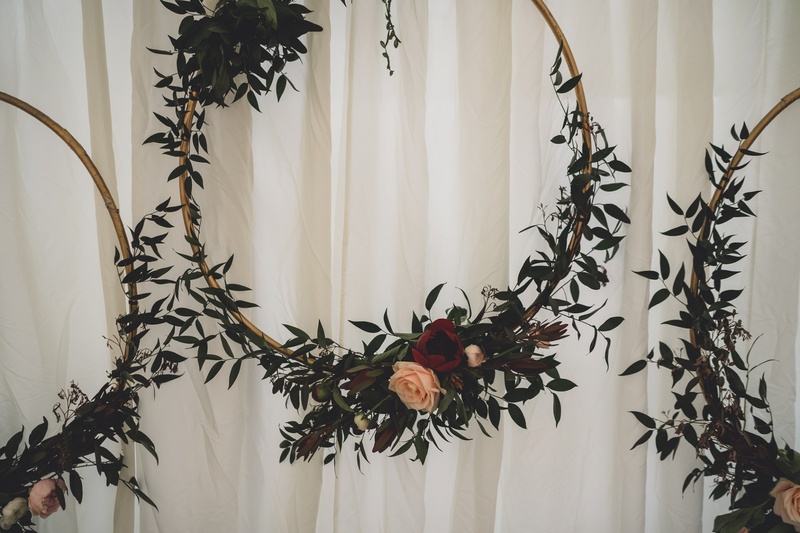 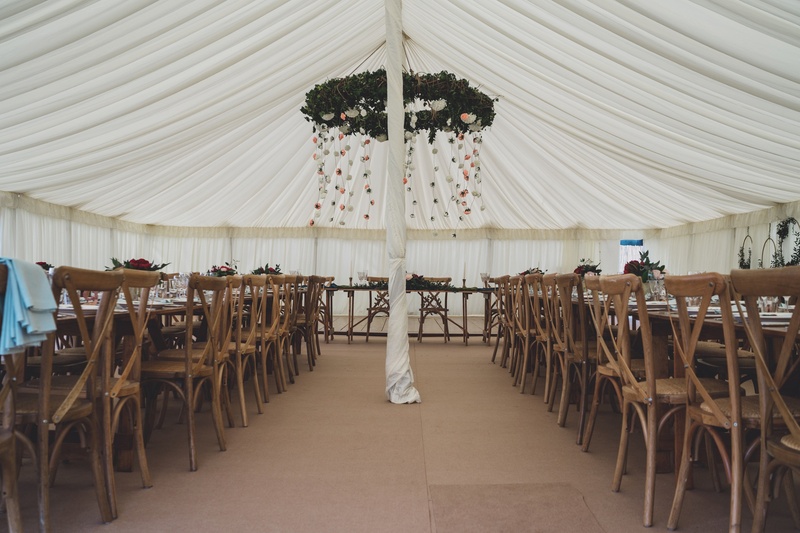 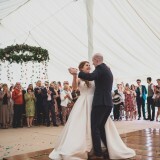 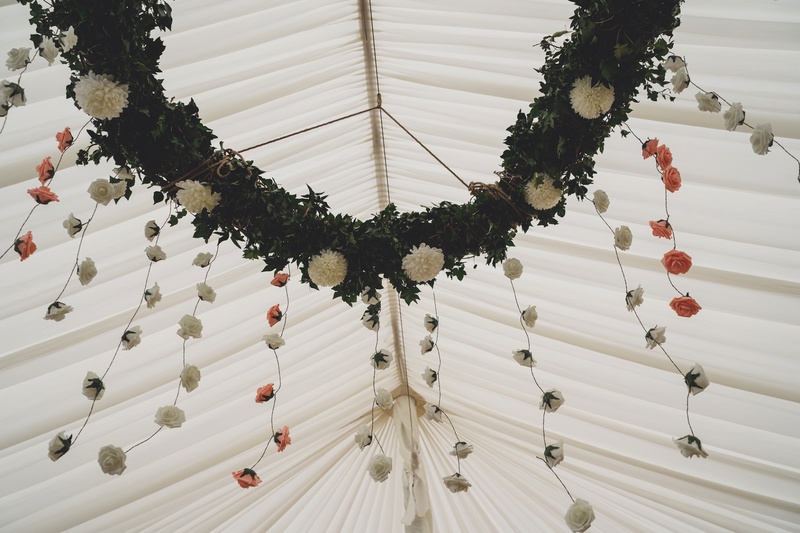 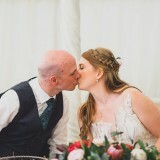 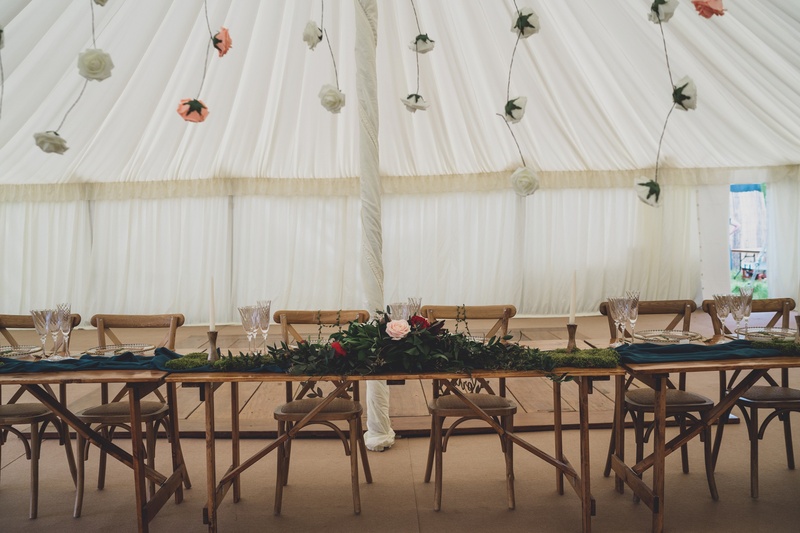 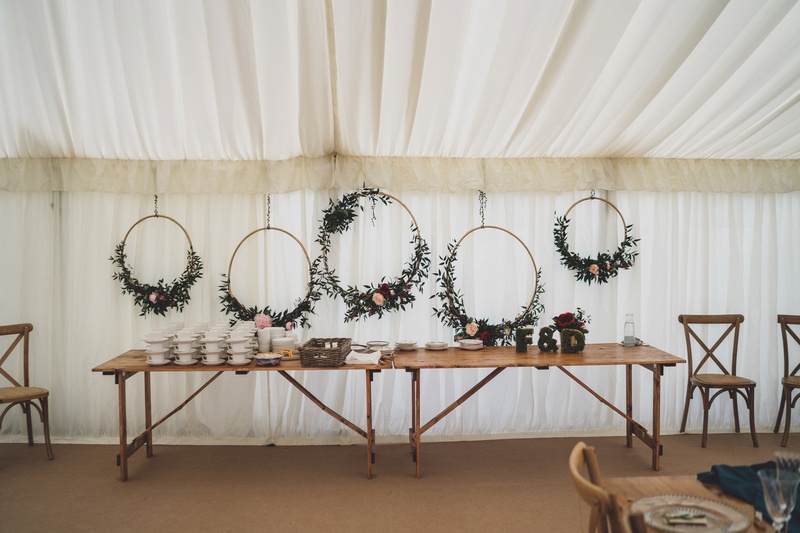 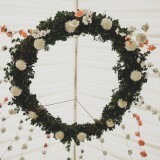 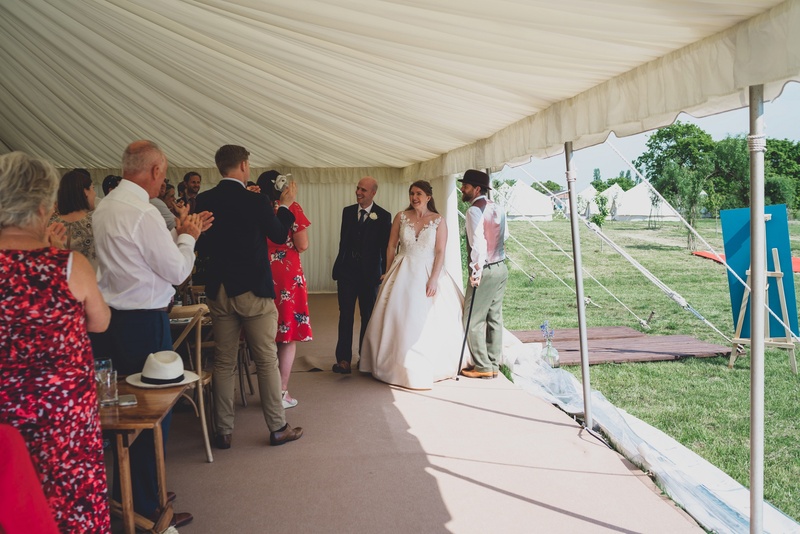 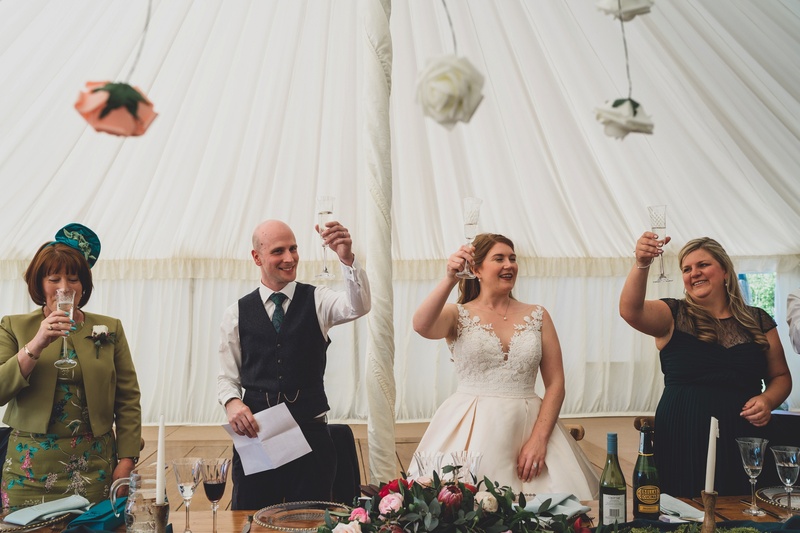 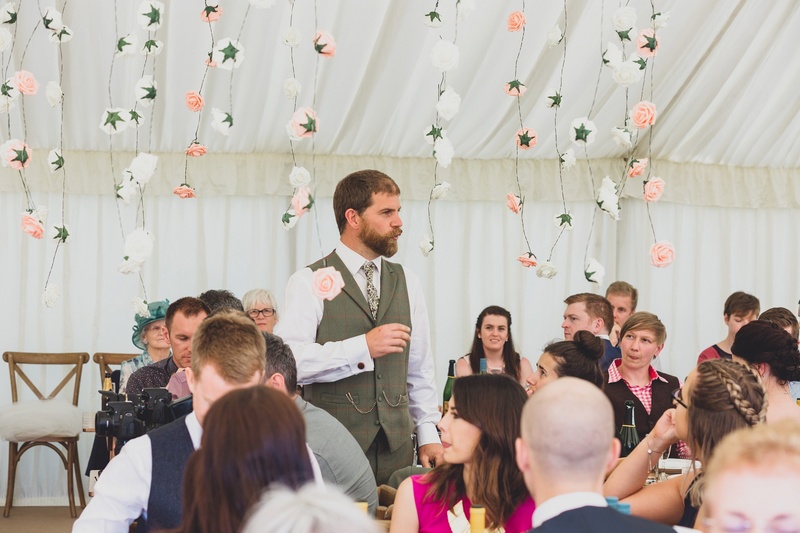 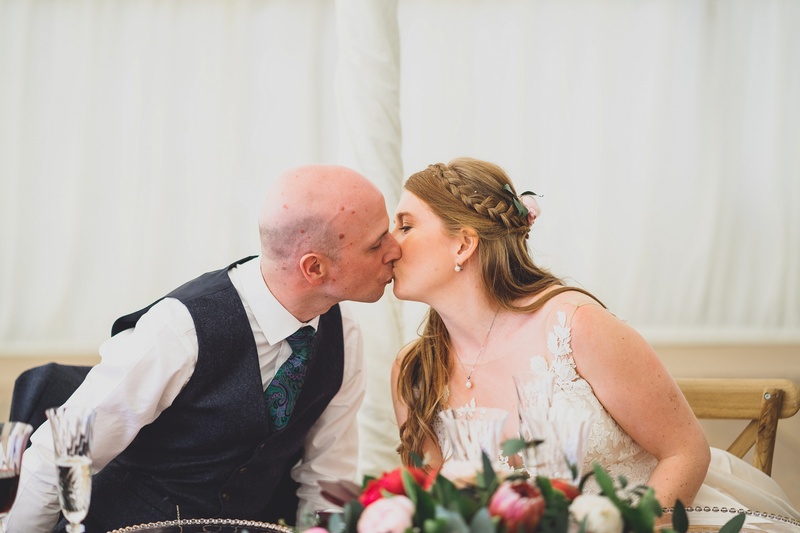 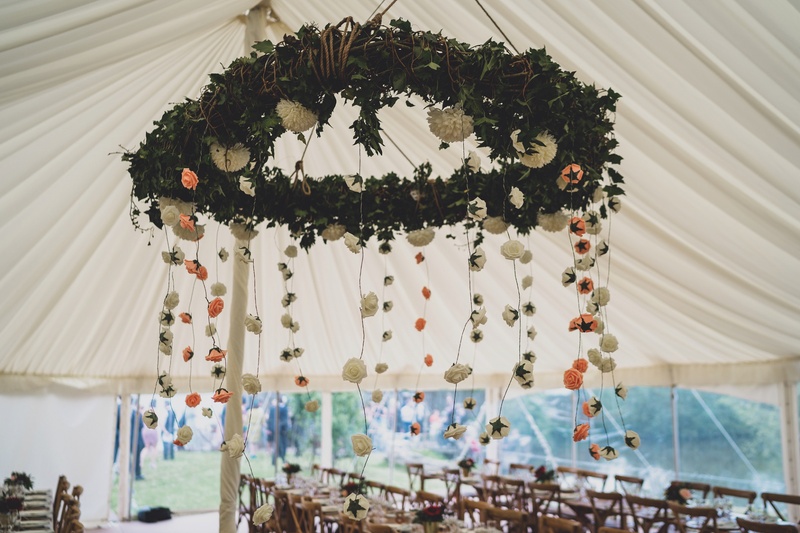 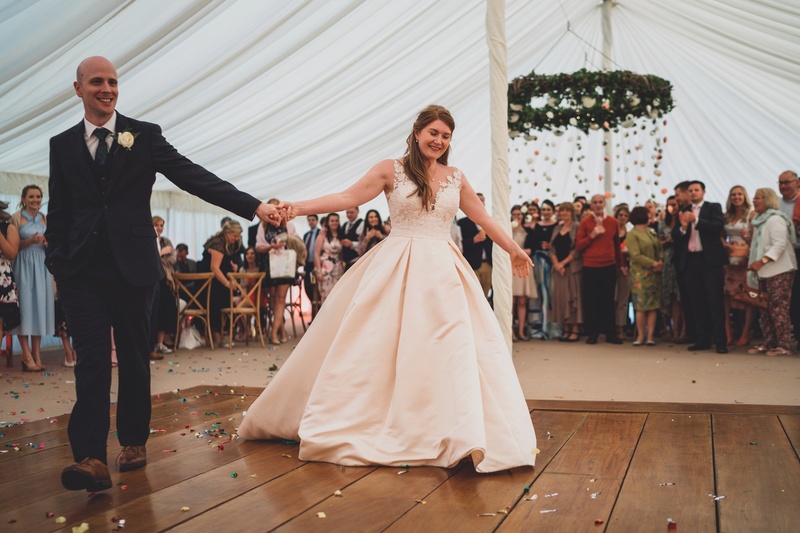 We love the floral theme, with a giant flower chandelier taking pride of place in the centre of the marquee, dripping with blooms and echoing the country vibe. 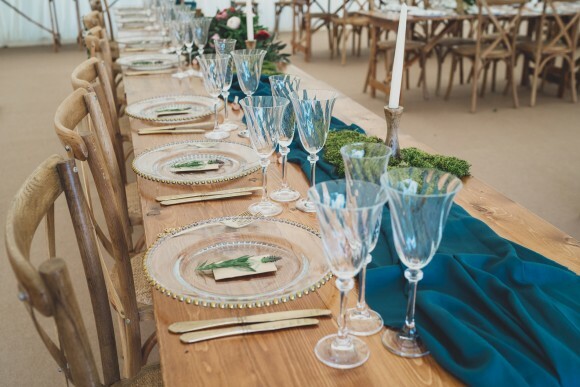 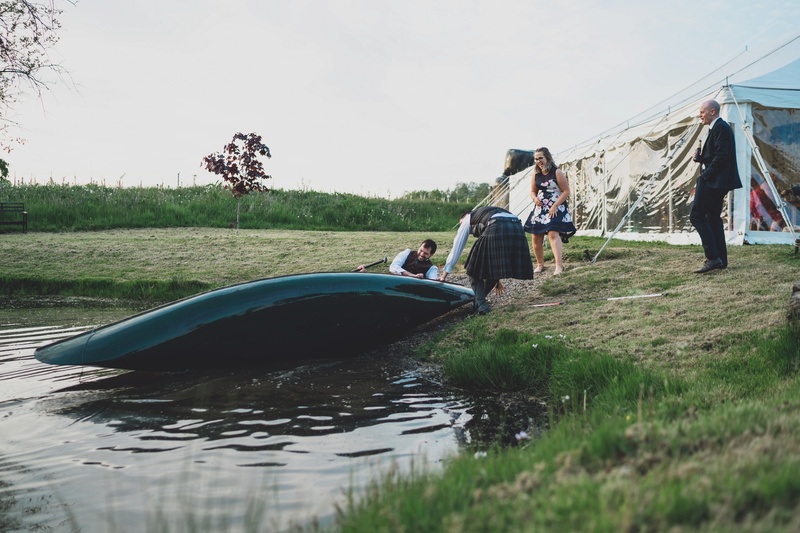 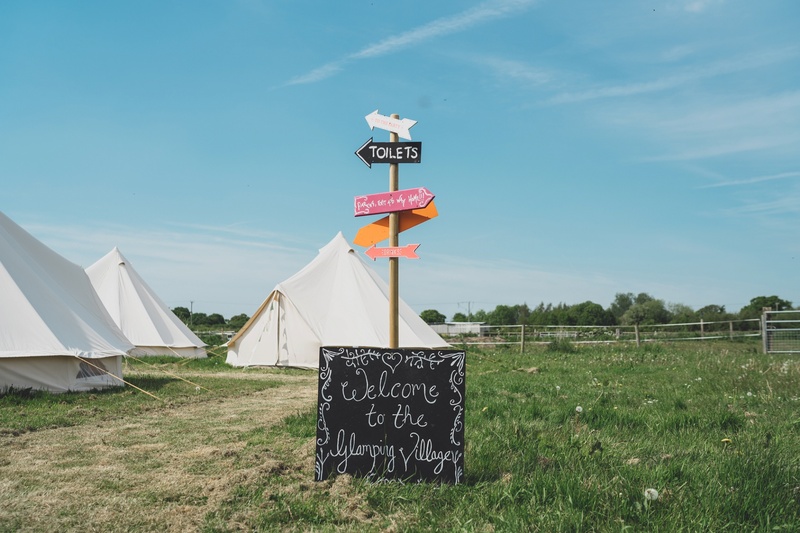 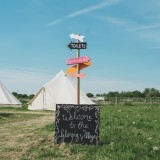 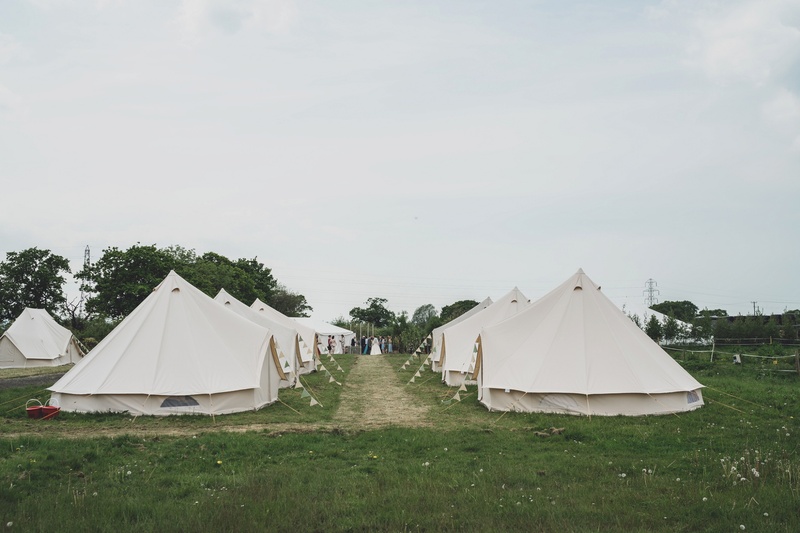 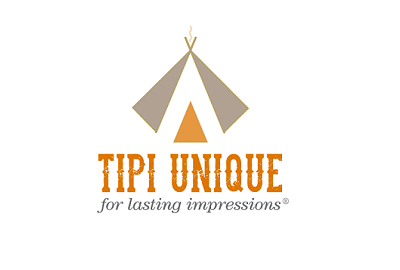 The fact that guests could glamp on site is a huge tick for a rustic wedding and brings a real sense of fun to the occasion. 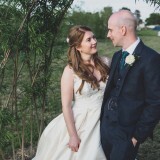 freya says: We got engaged on a country walk in Dan’s home town of Sowerby Bridge. 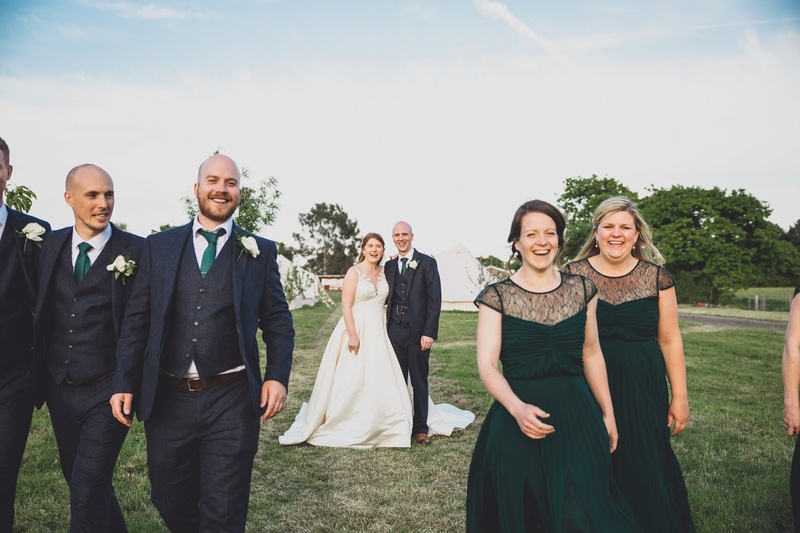 With a view overlooking the valley, Dan got down on one knee with his brother and partner there to capture the moment forever. 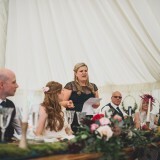 It was a complete shock and I don’t think either of us managed to get any words out for a few moments! 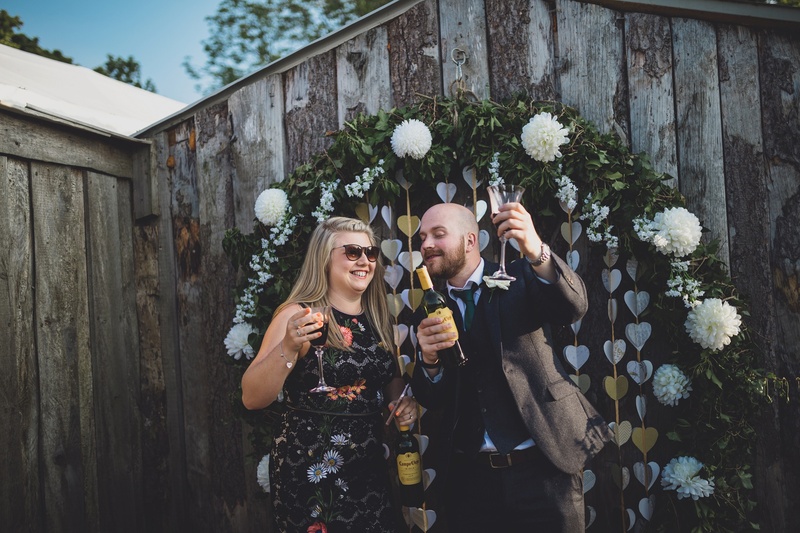 Dan got out the words “Will you marry me?” and with a “yes” from me and the ring on my finger, we were off to the pub for a celebratory drink! 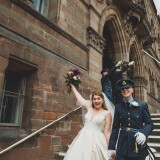 We got married on 18th May 2018. 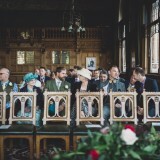 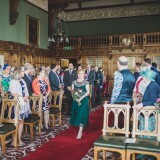 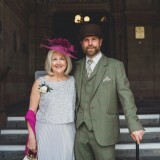 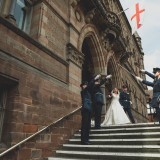 Our ceremony was in Chester Town Hall. 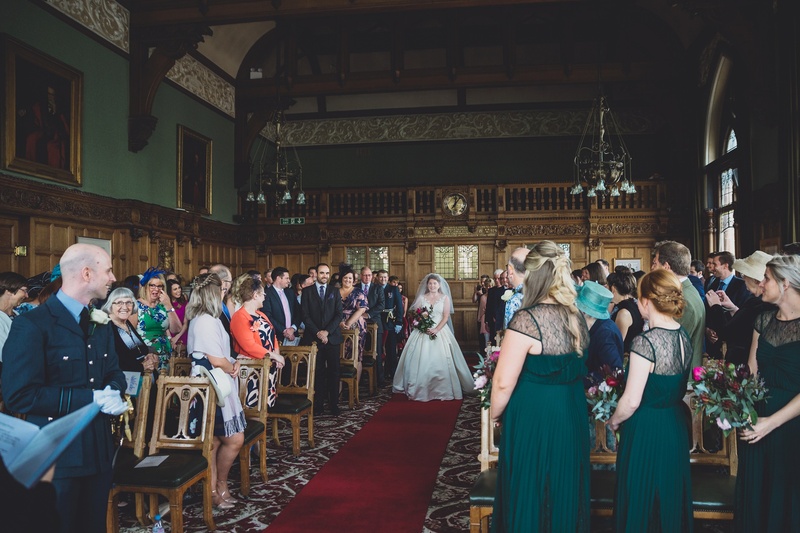 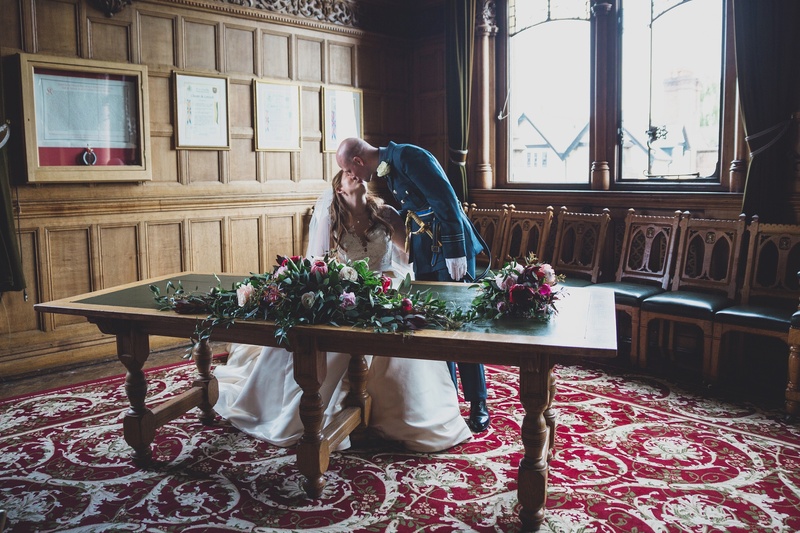 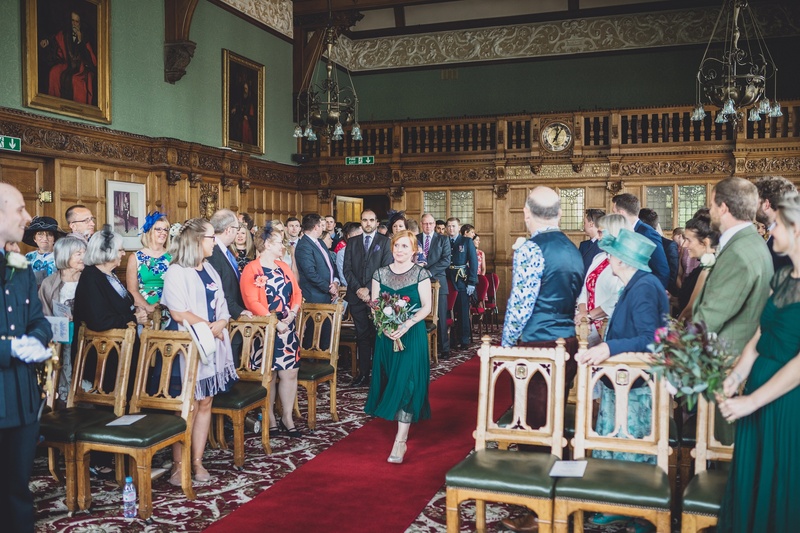 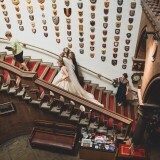 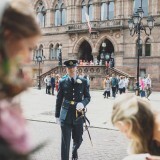 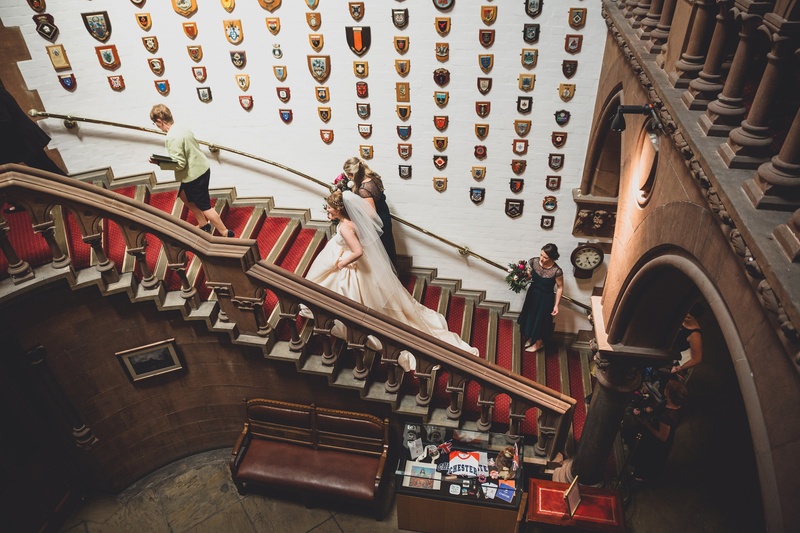 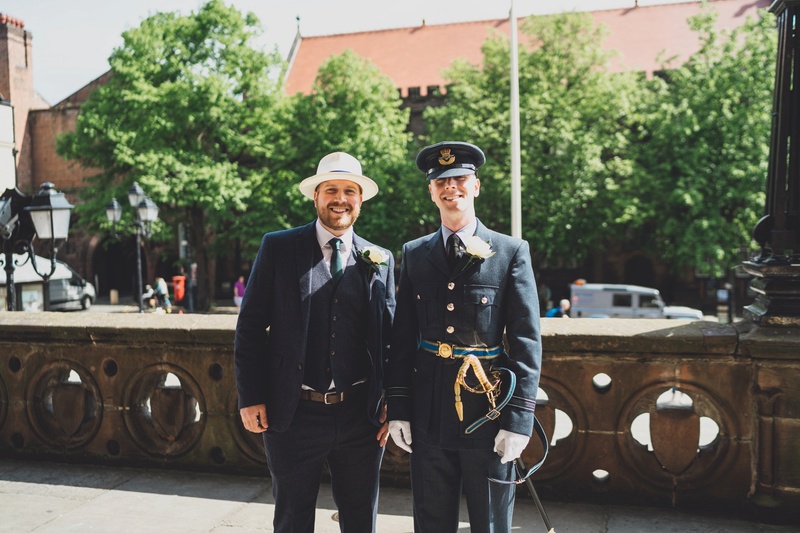 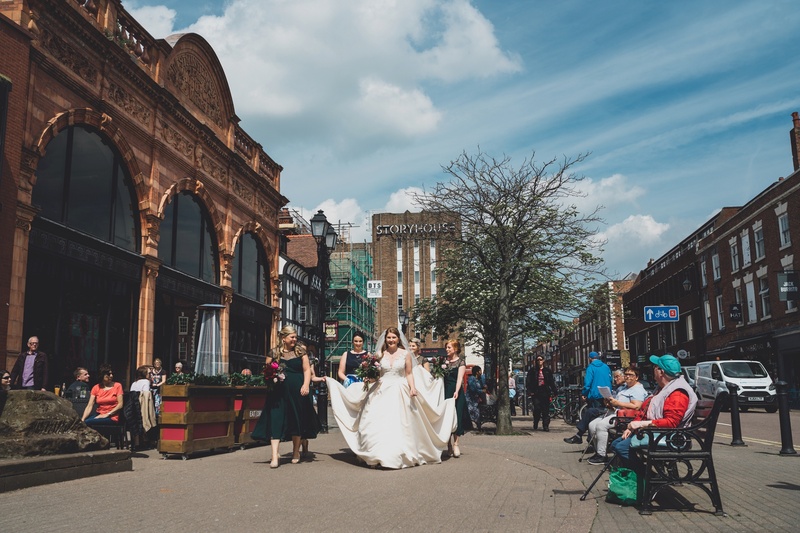 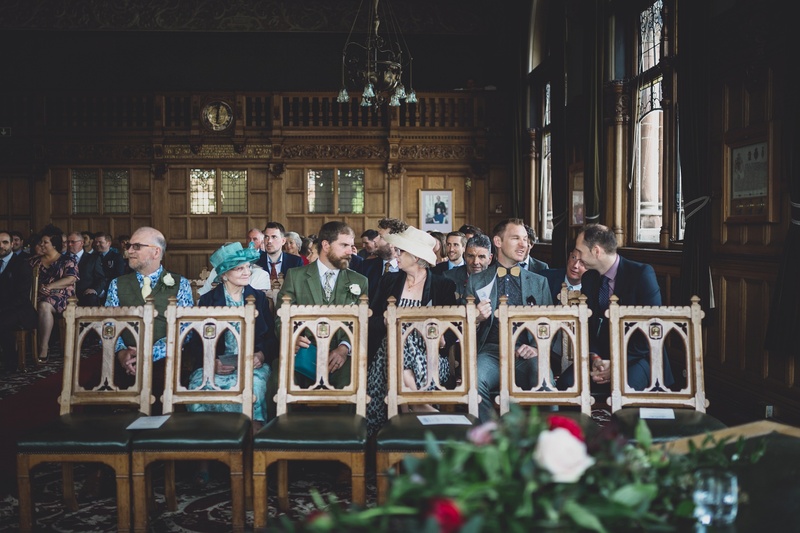 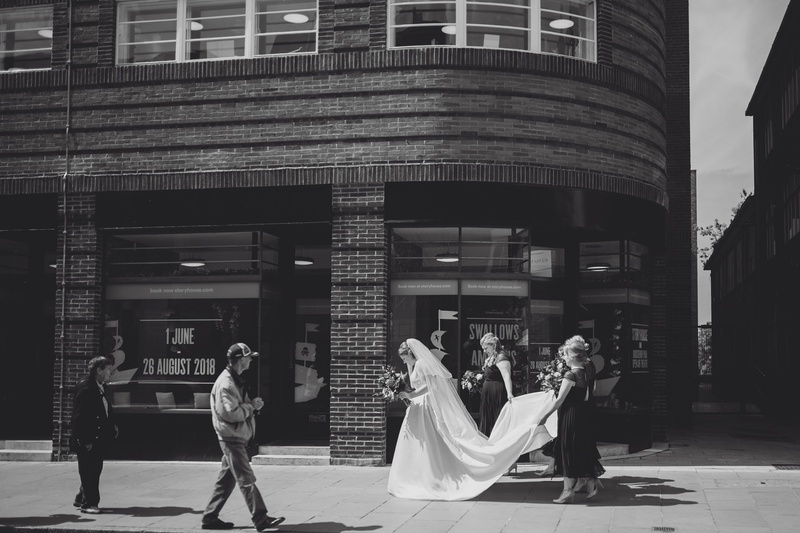 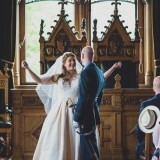 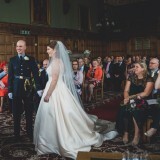 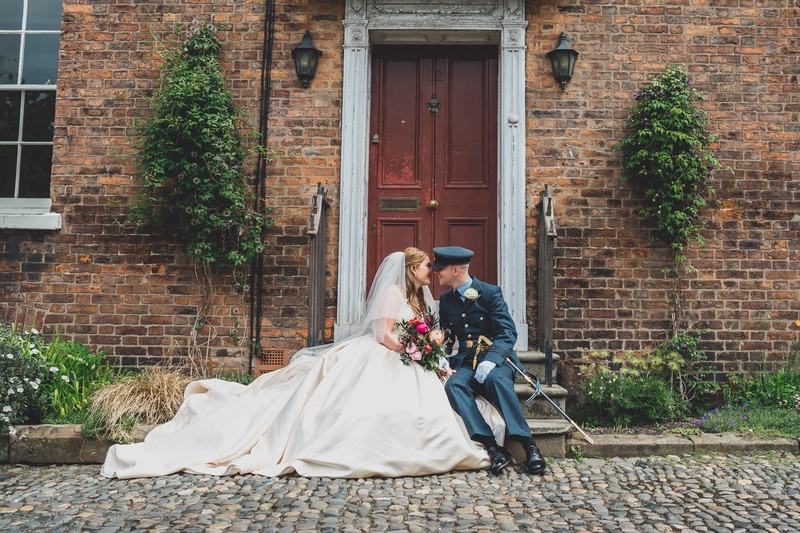 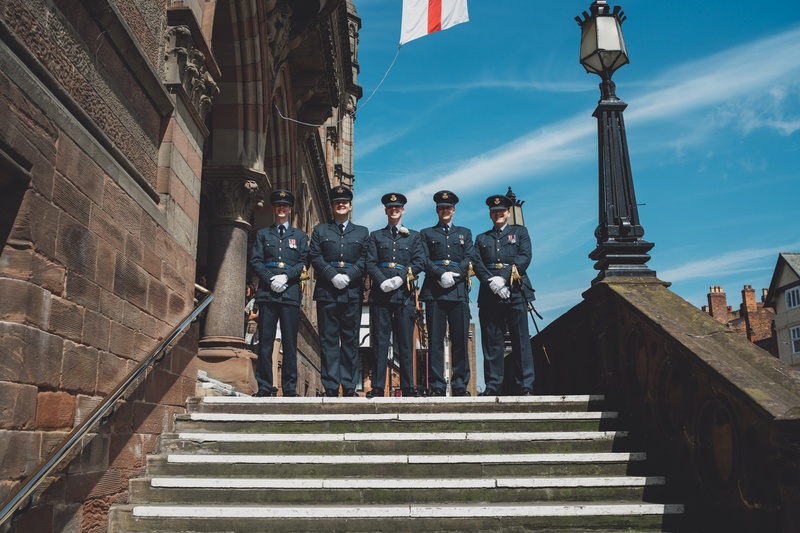 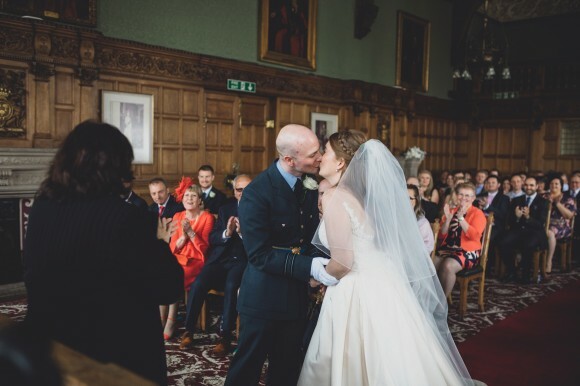 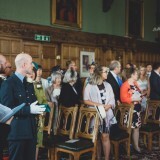 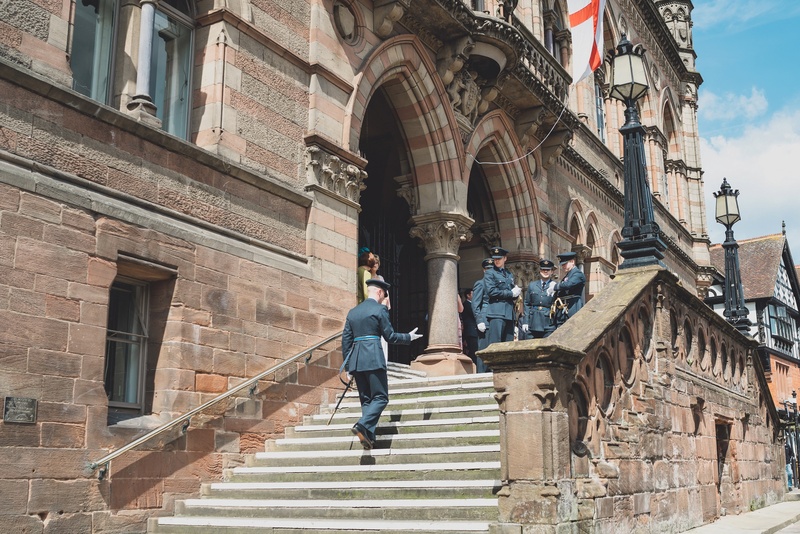 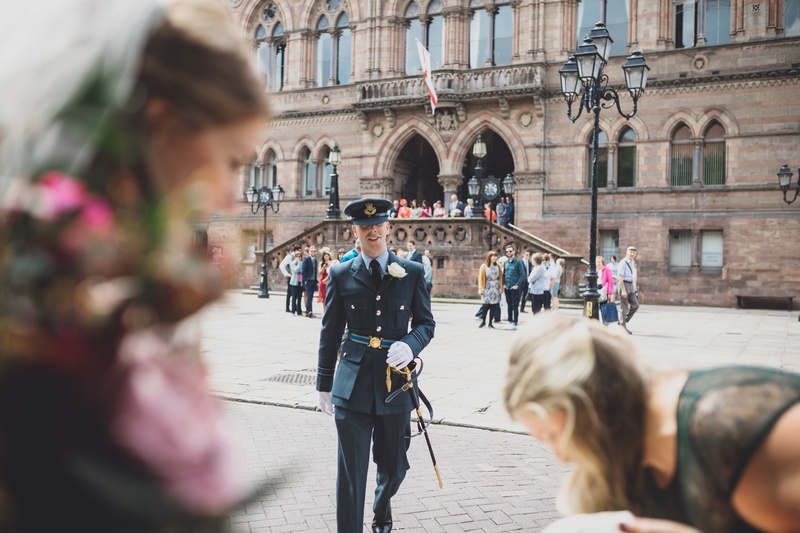 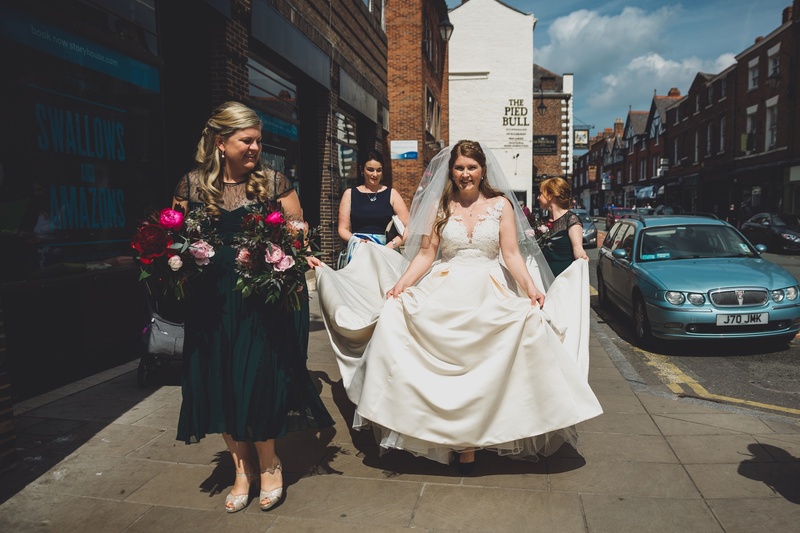 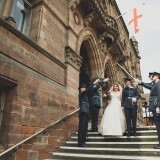 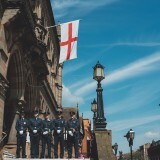 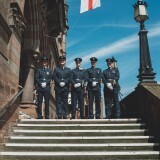 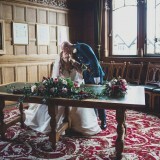 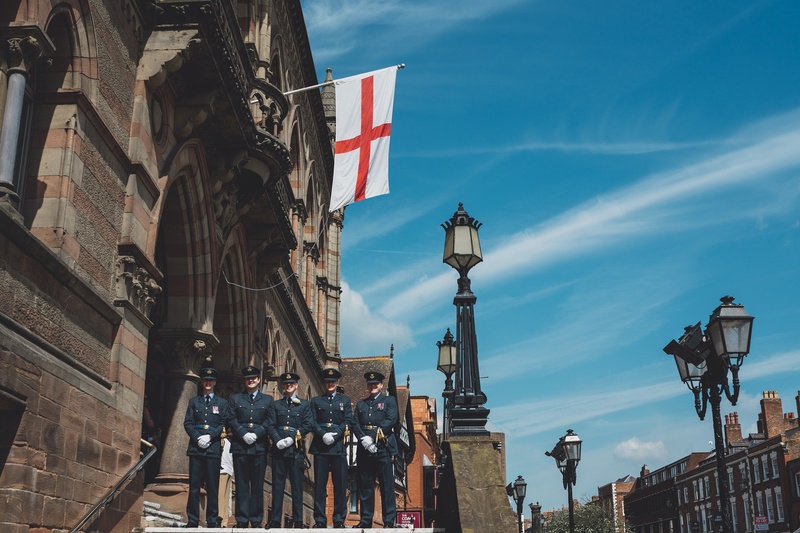 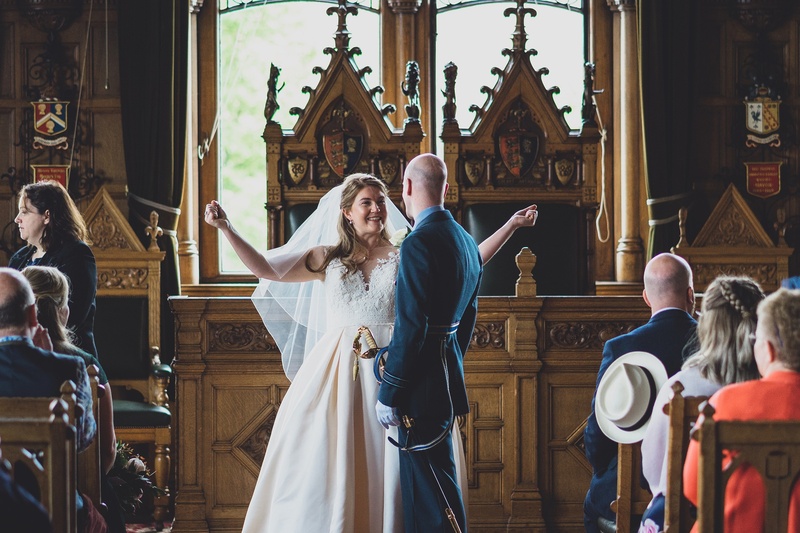 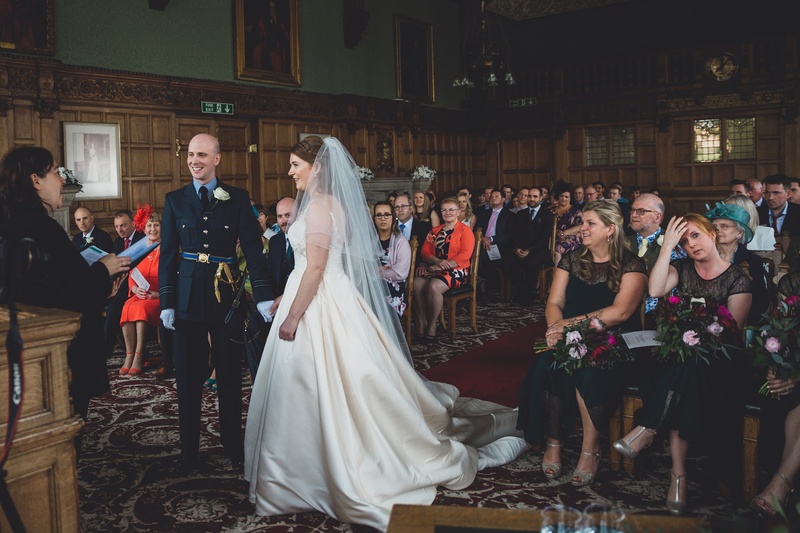 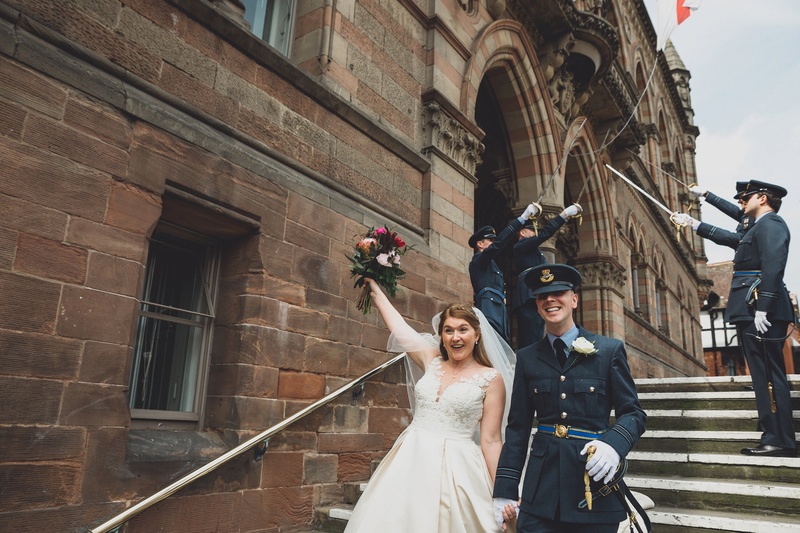 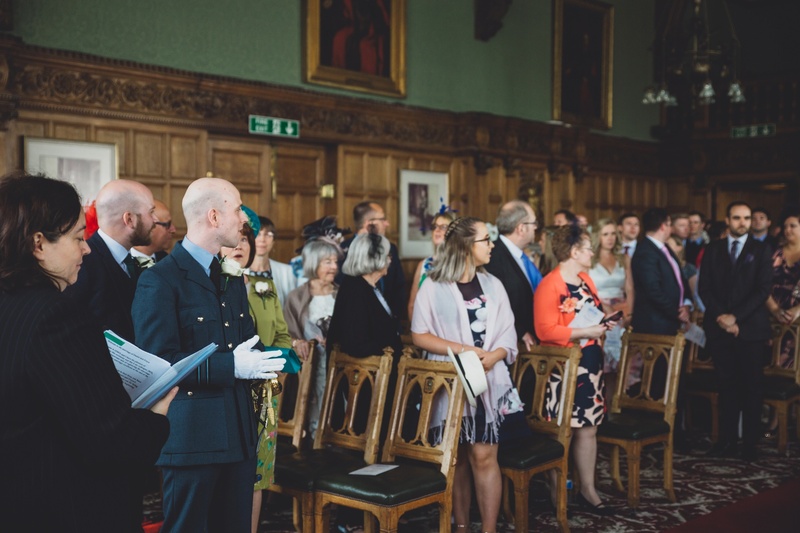 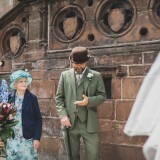 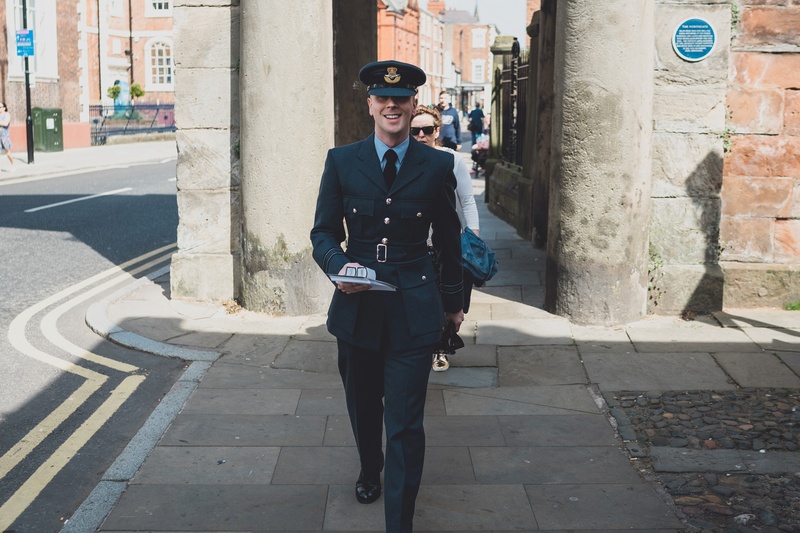 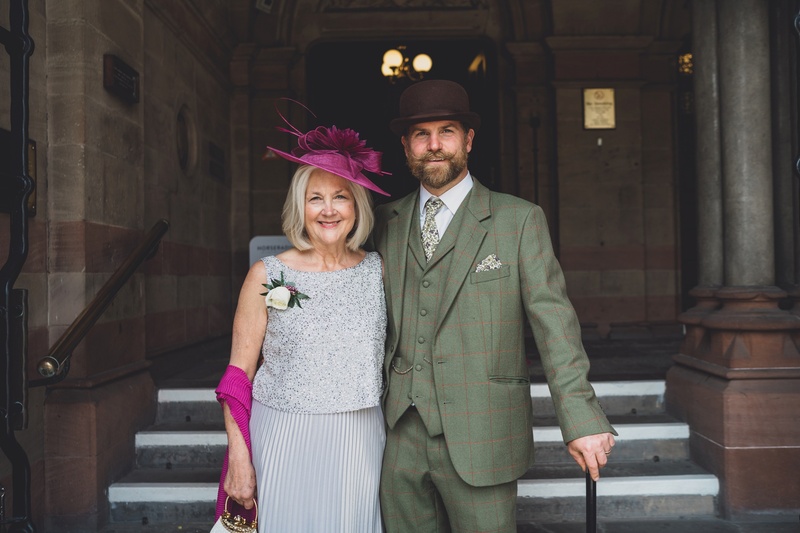 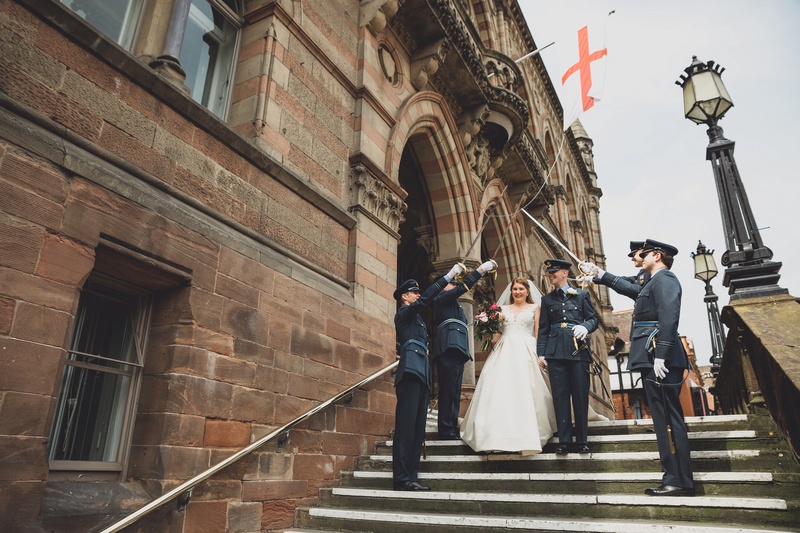 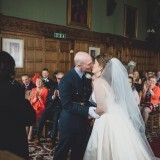 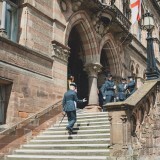 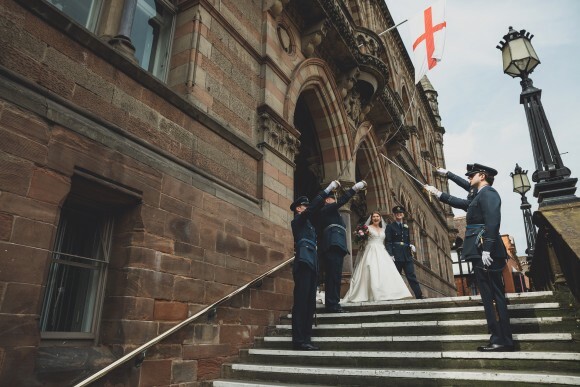 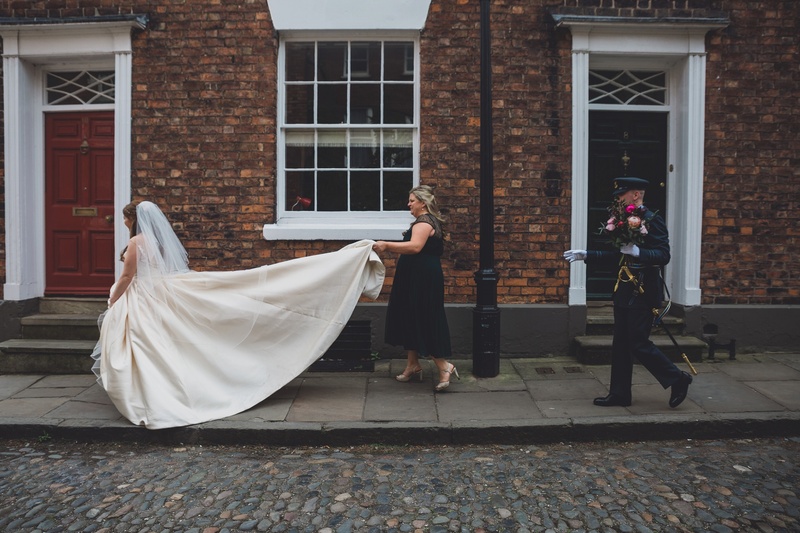 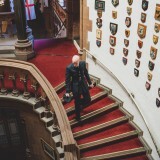 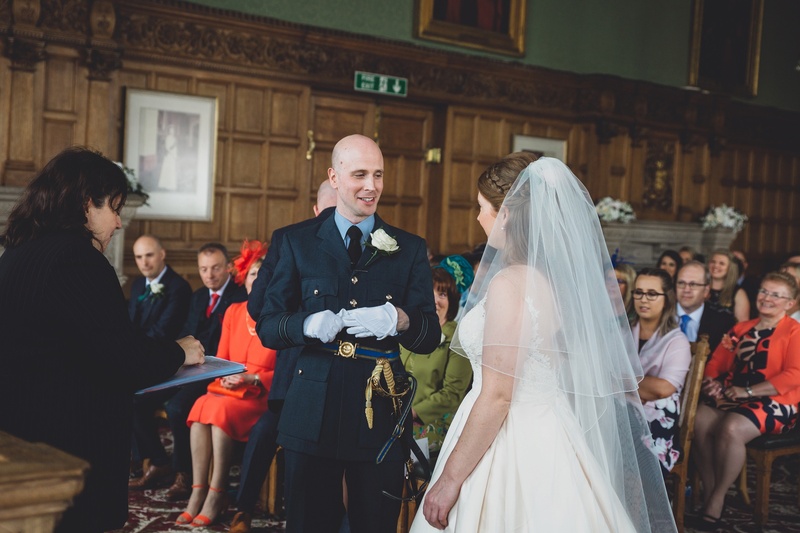 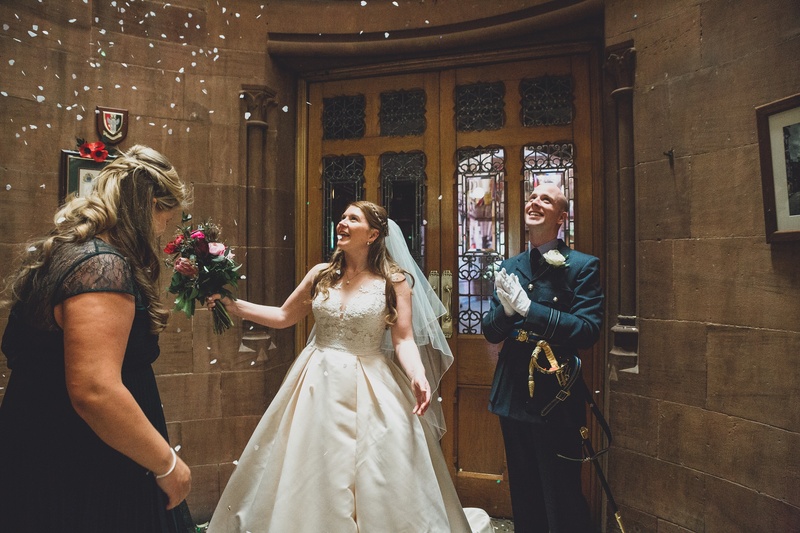 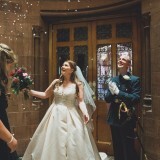 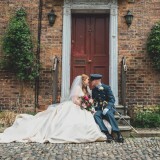 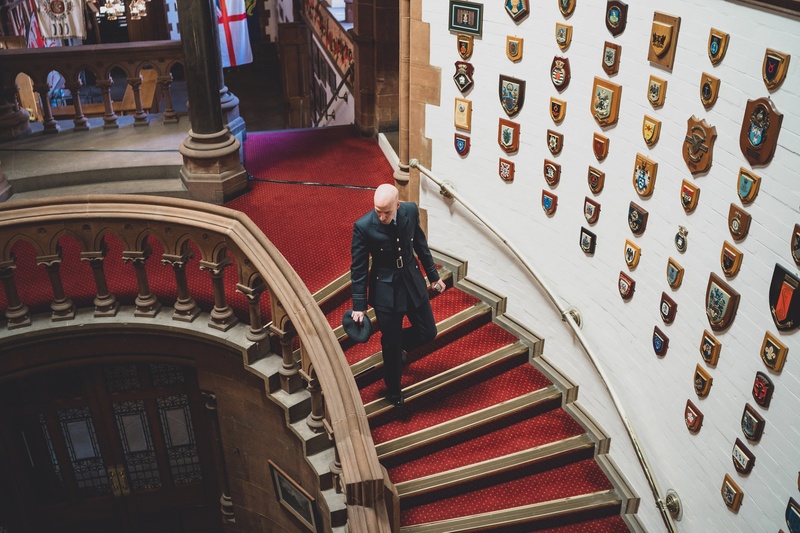 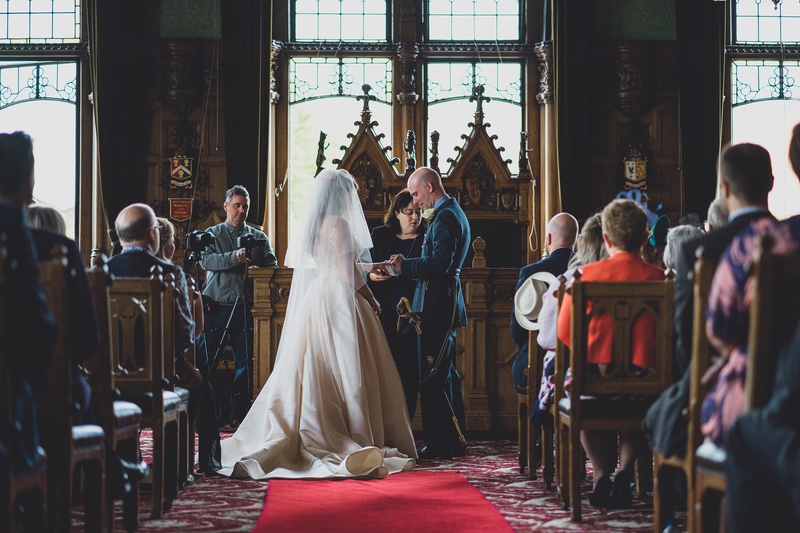 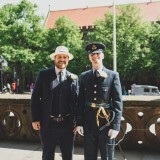 With Dan in uniform (he is a squadron leader in the RAF), we felt the Town Hall suited the occasion and I loved the idea of getting married in Chester town centre. 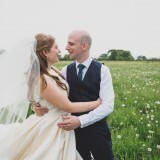 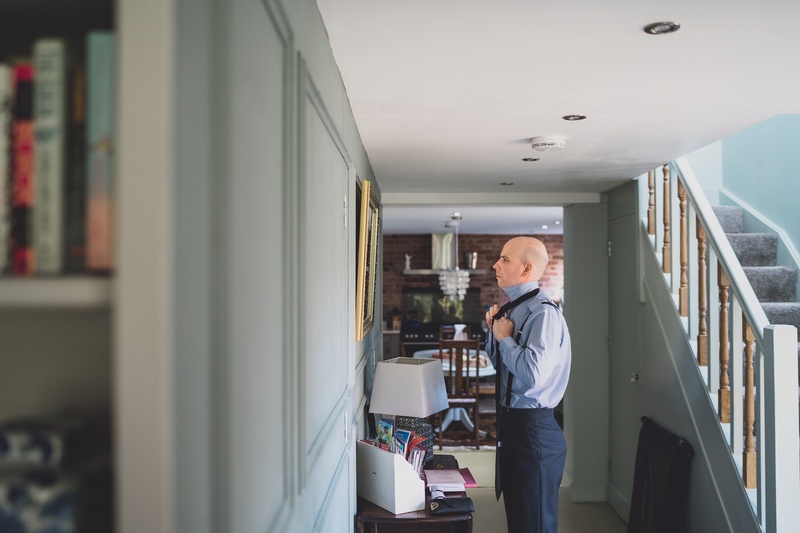 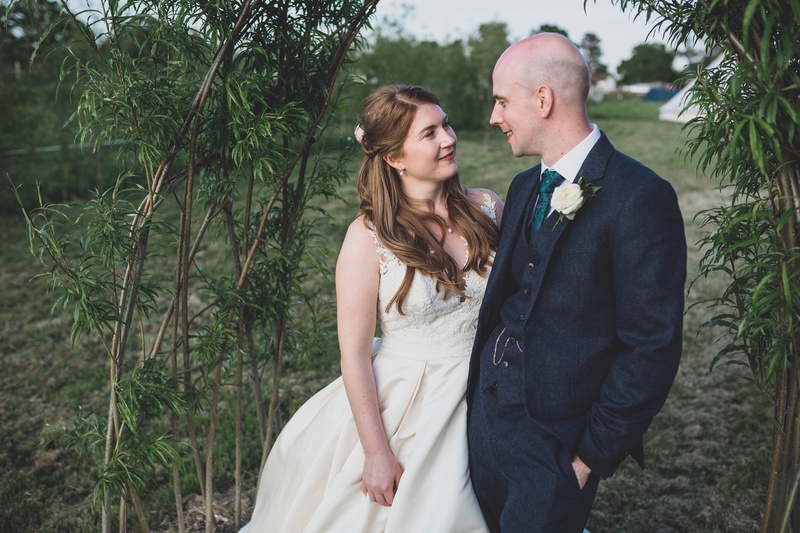 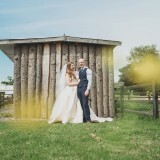 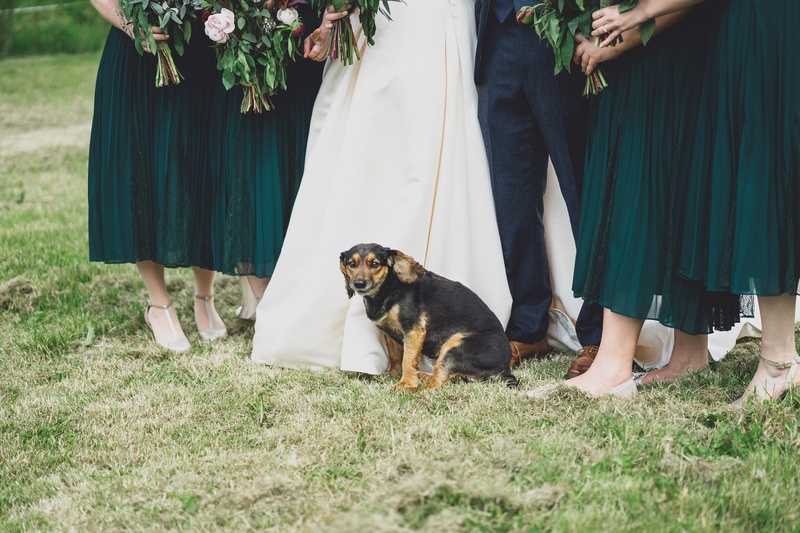 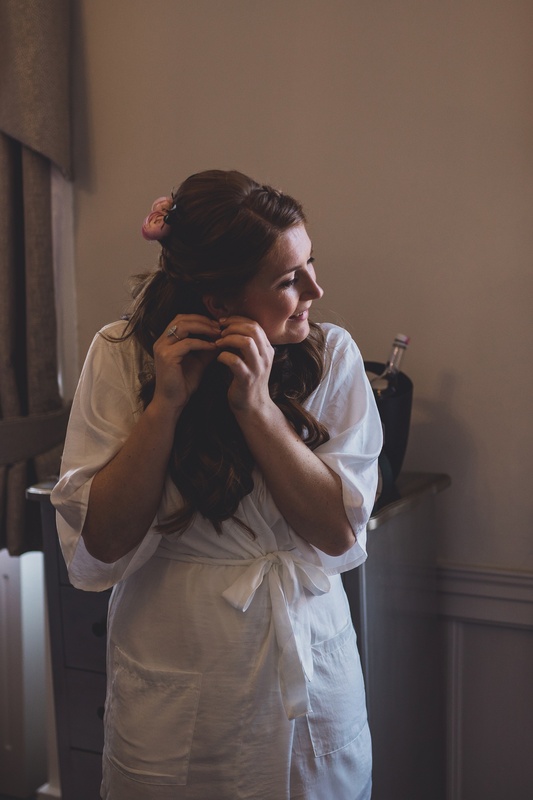 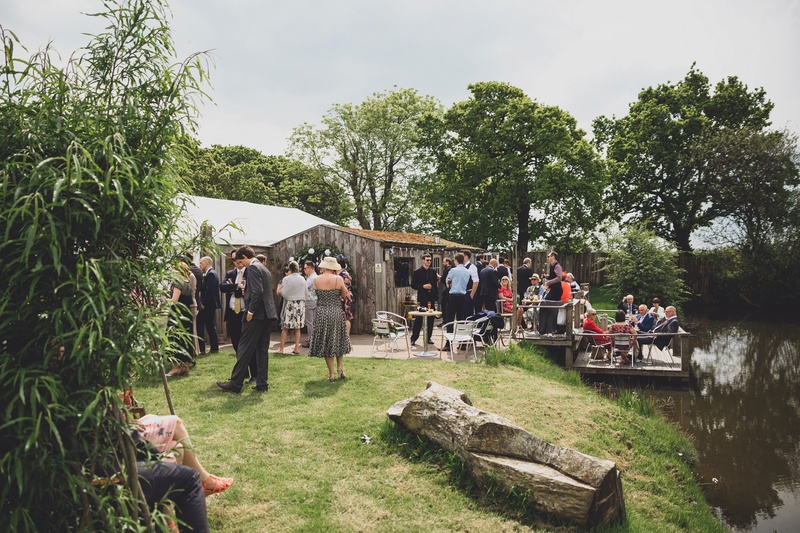 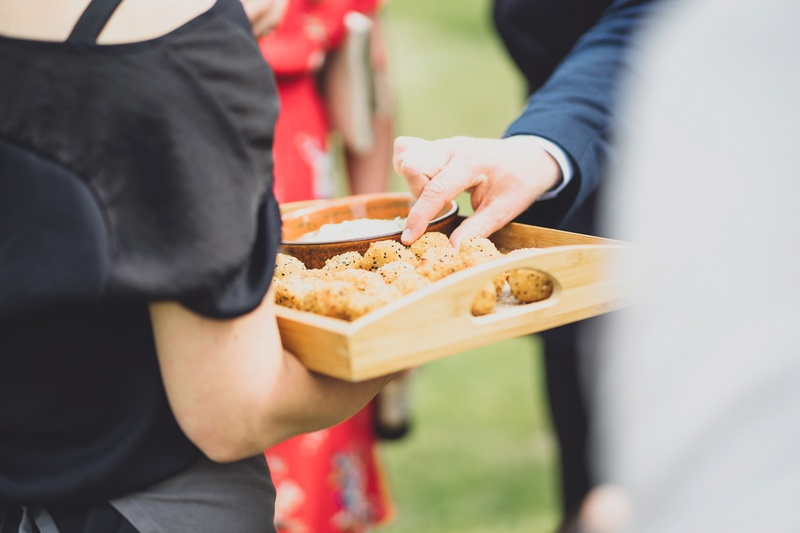 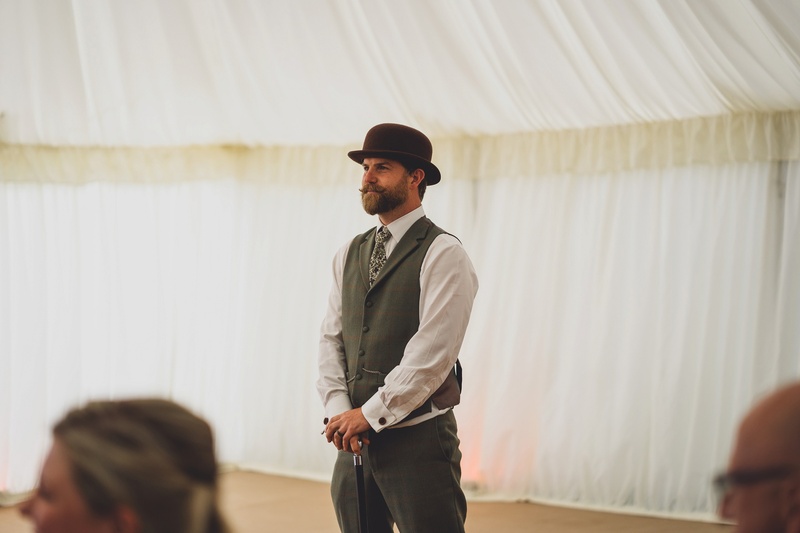 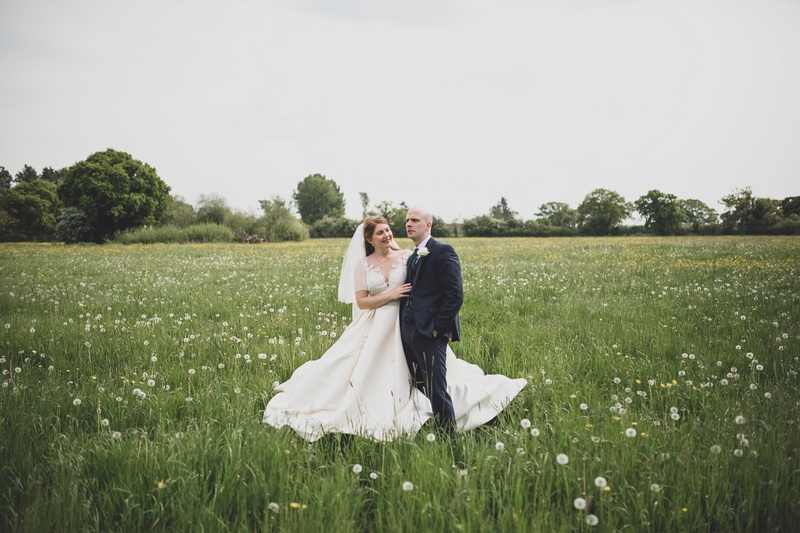 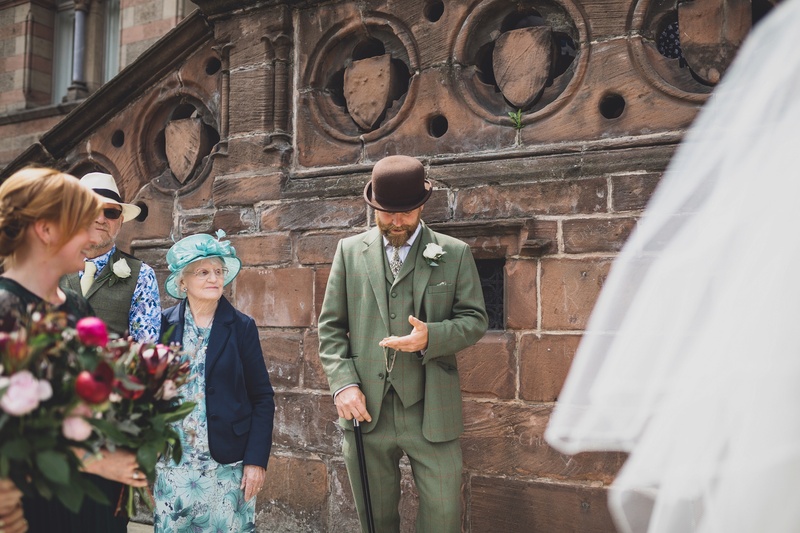 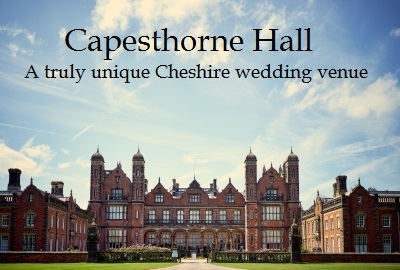 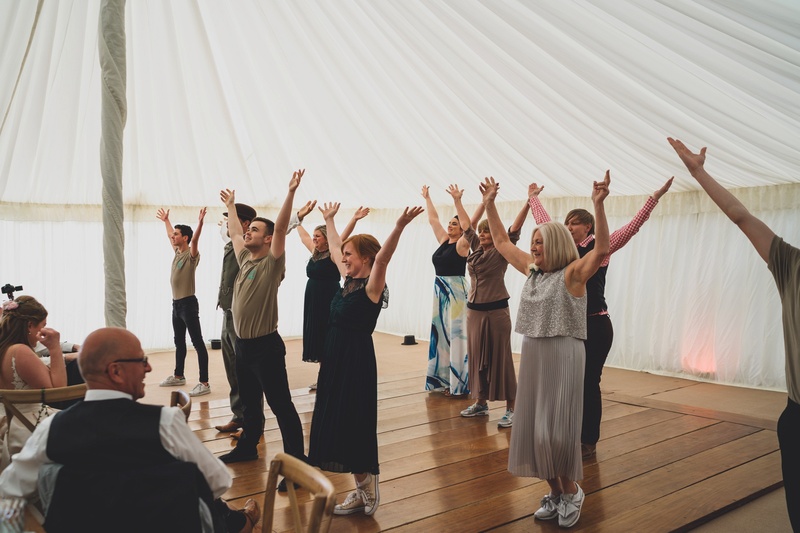 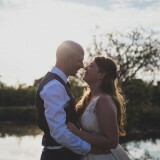 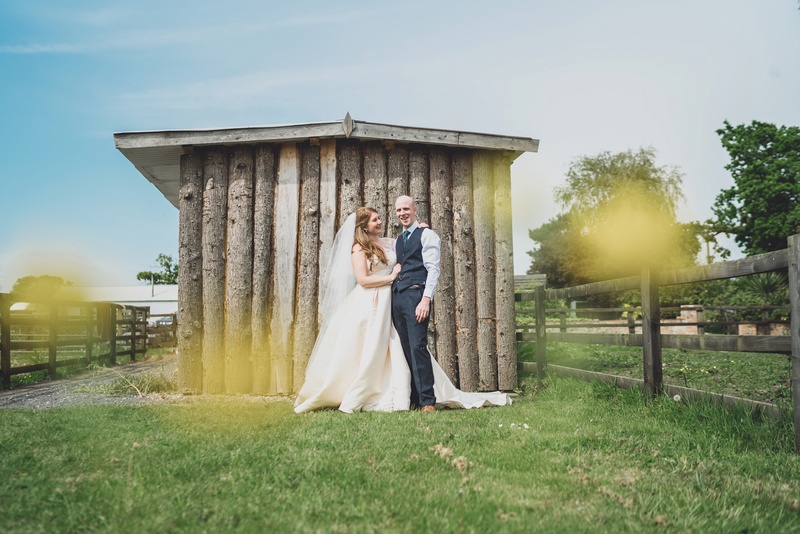 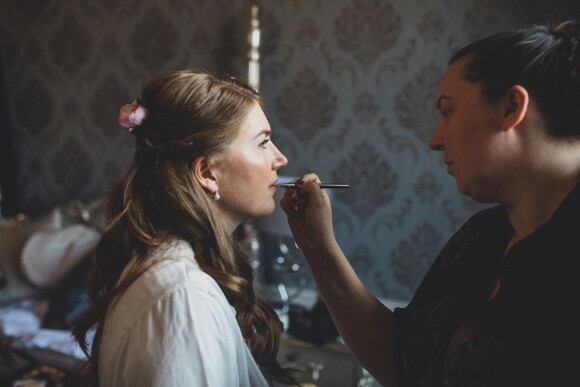 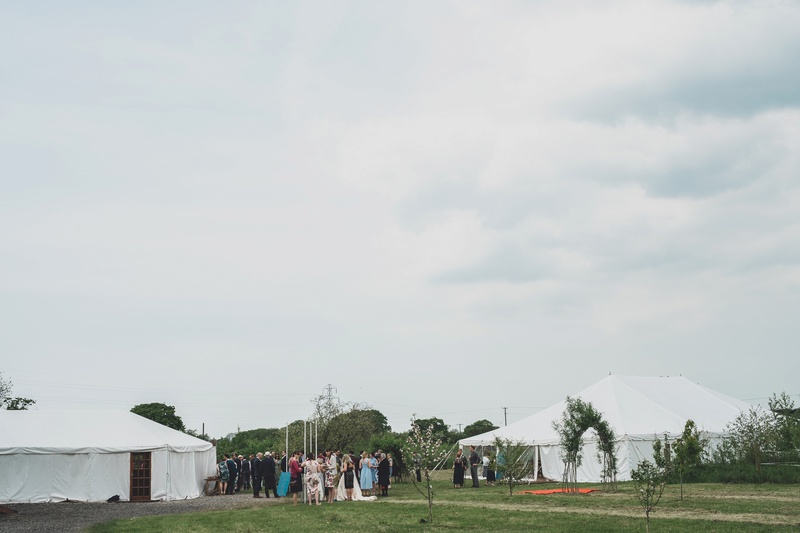 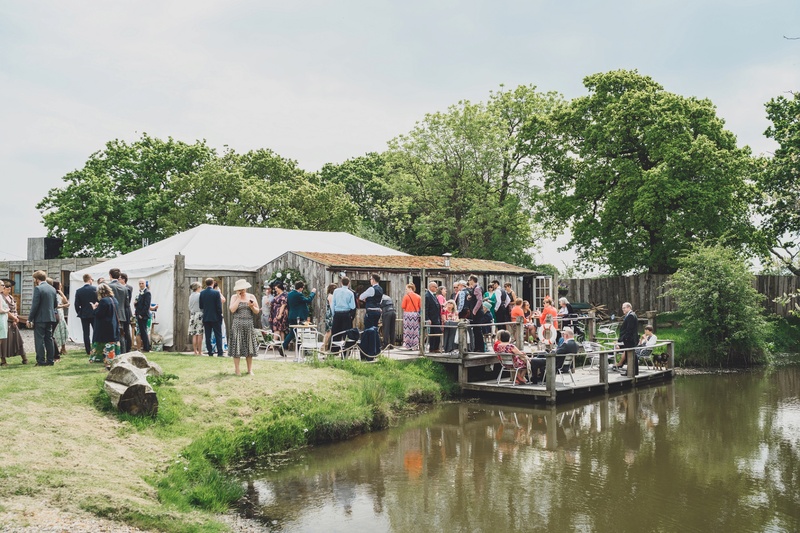 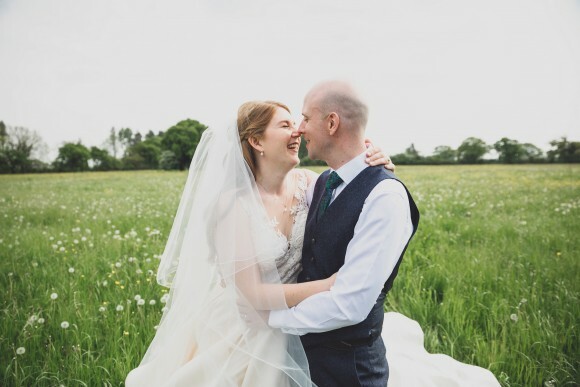 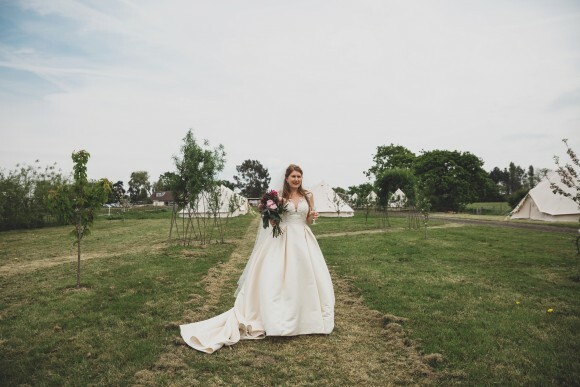 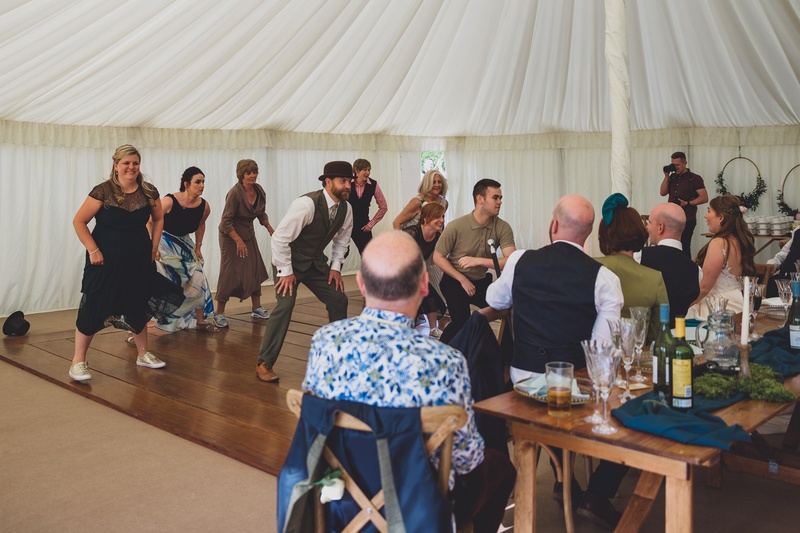 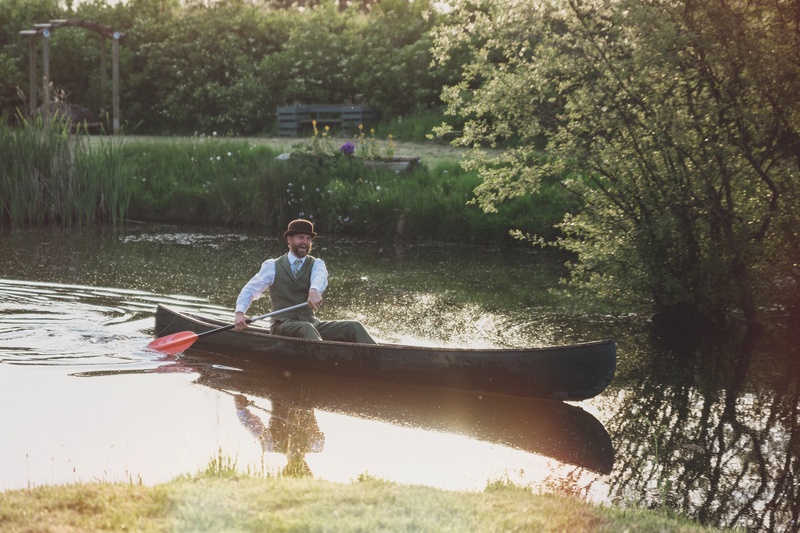 The reception venue was an easy choice, as my family runs the wedding venue Kings Acre, which is on the outskirts of Chester in the small village of Saughall. 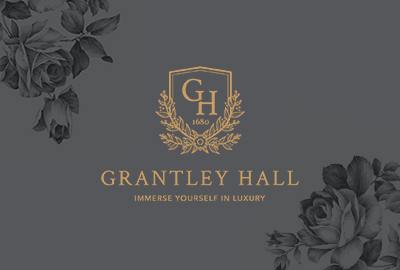 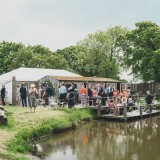 It is a beautiful, friendly and relaxed venue. 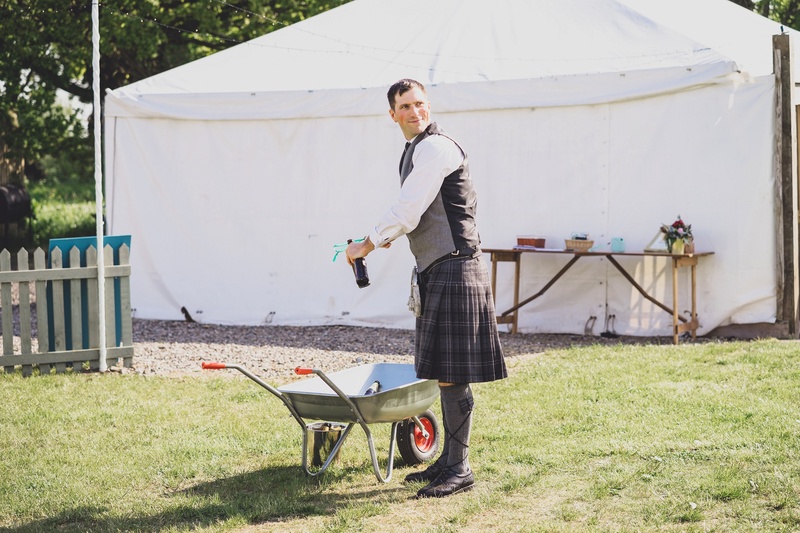 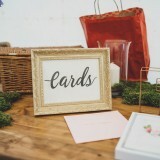 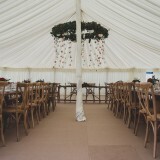 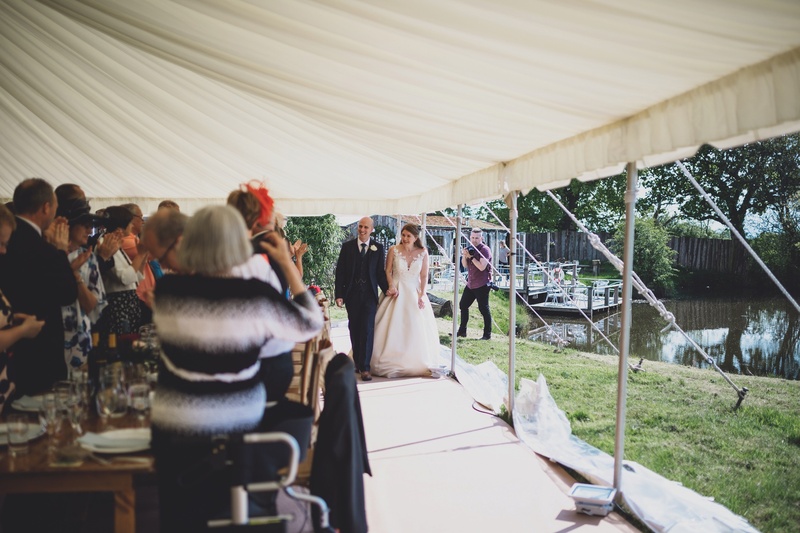 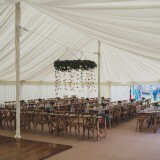 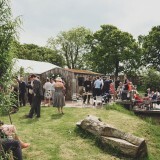 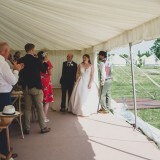 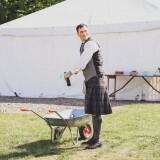 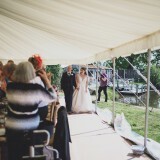 We had the freedom to do so much, having a marquee to decorate and lots of outdoor space! 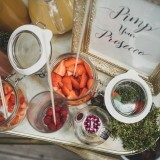 The bar is so cute and there are plenty of amazing spots to have the perfect pictures. 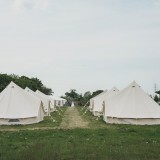 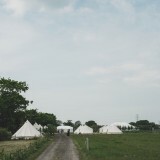 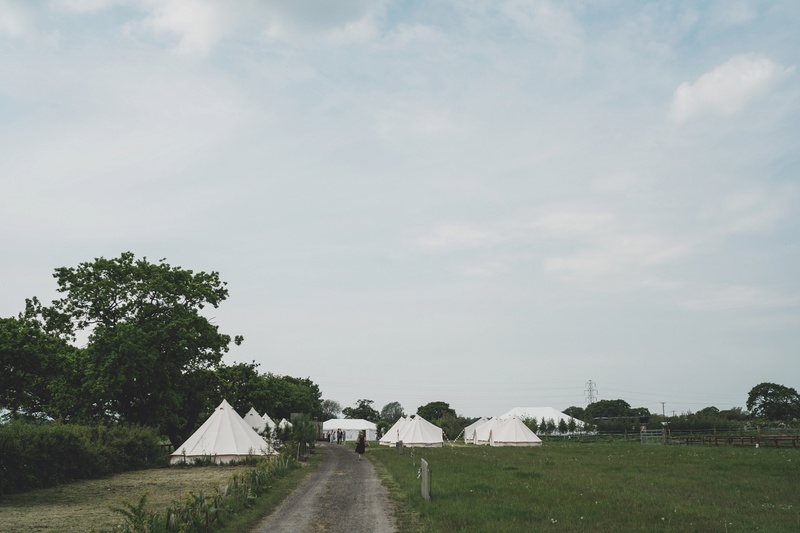 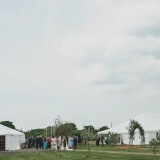 With a yurt village and camping, a lot of our guests stayed on site. 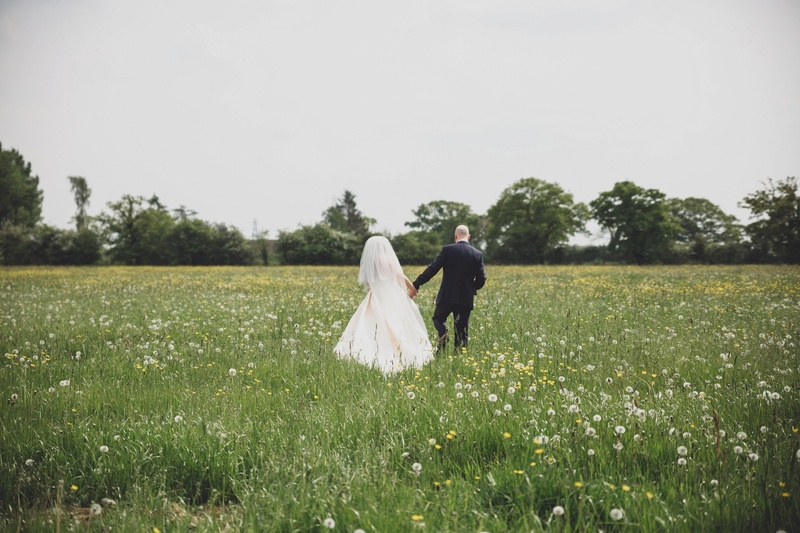 We would wholeheartedly recommend Kings Acre to other couples. 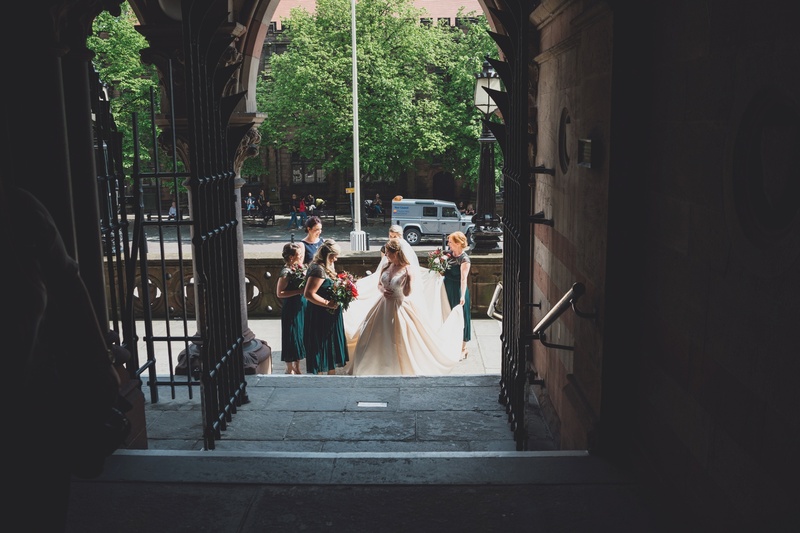 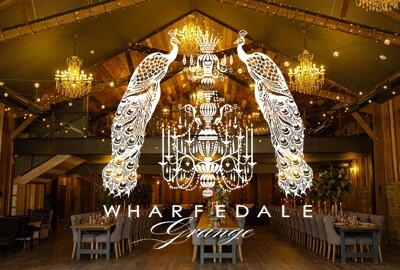 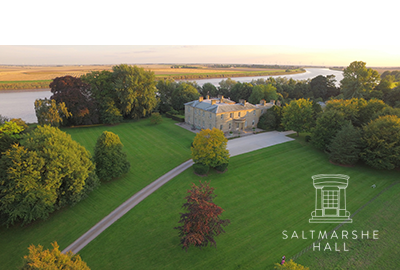 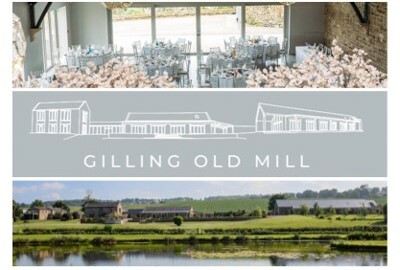 It is a wonderful place to get married: everything runs so smoothly, the venue is beautiful and it all leads to a relaxed day where everyone has fun. 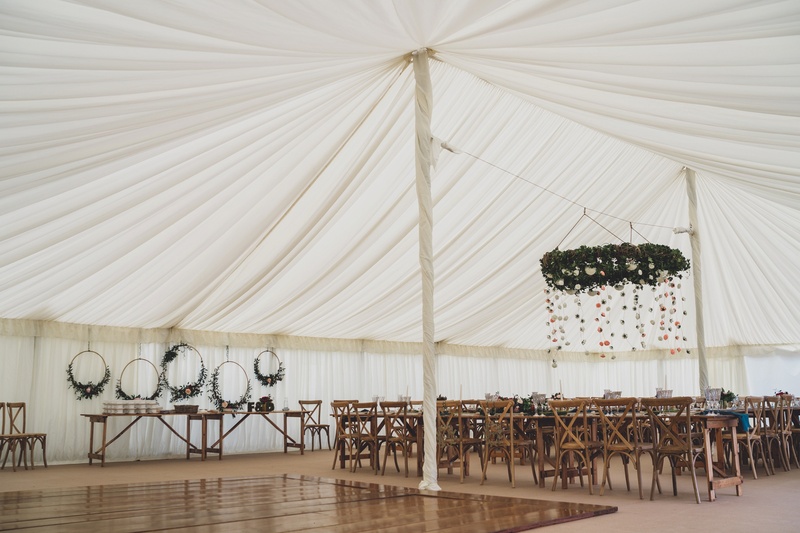 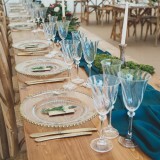 You can do so much with the space that you can really make it into the vision you dreamed of for your special day! 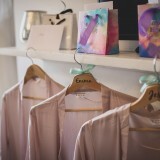 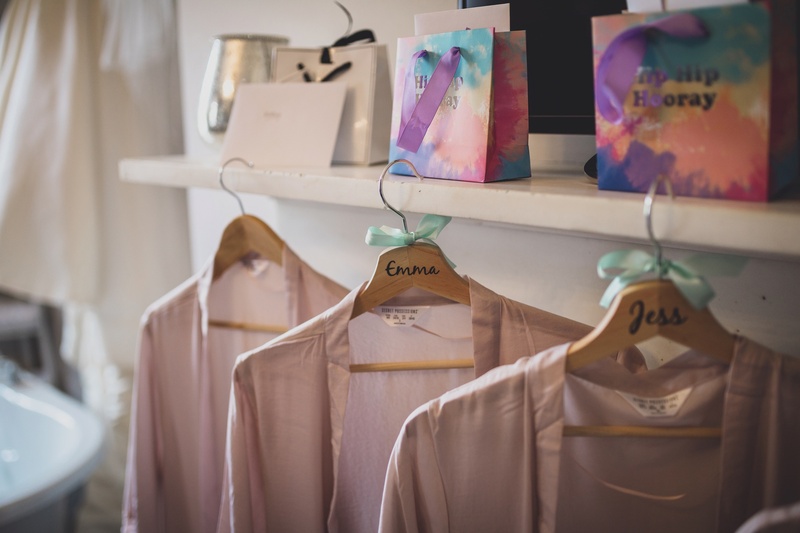 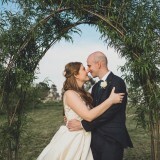 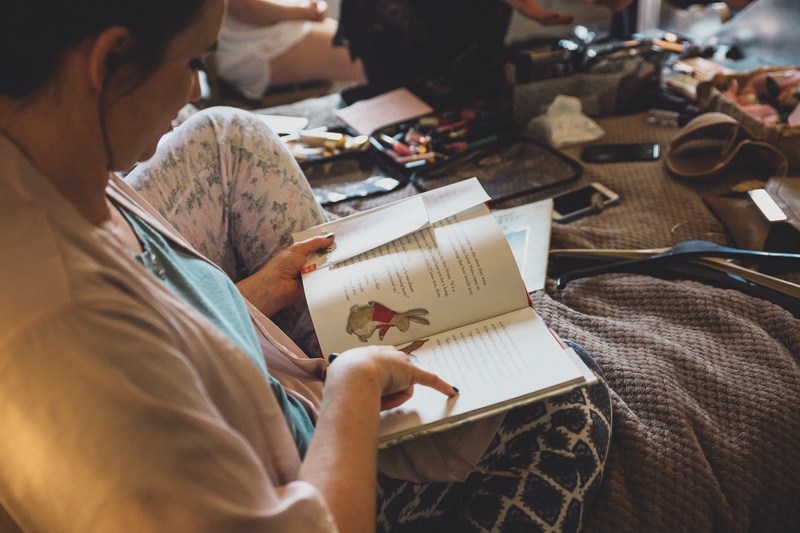 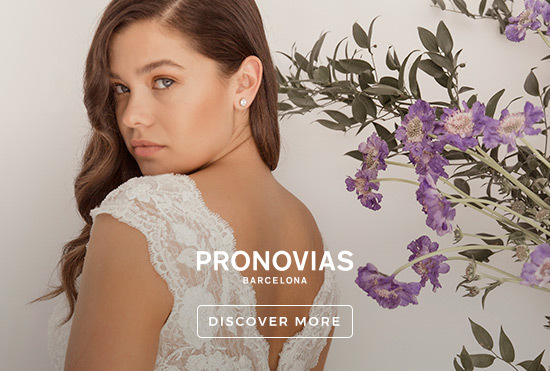 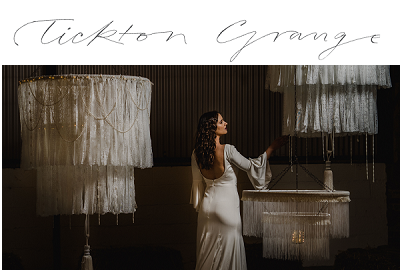 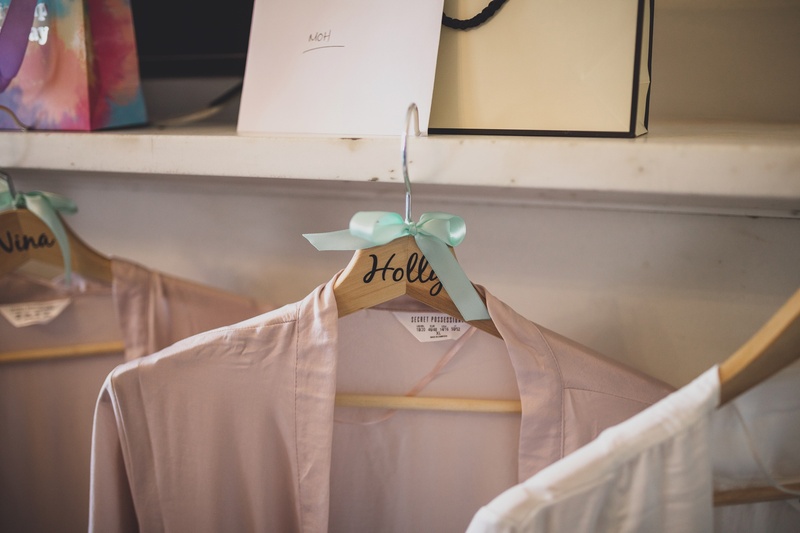 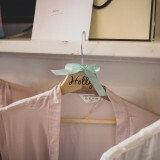 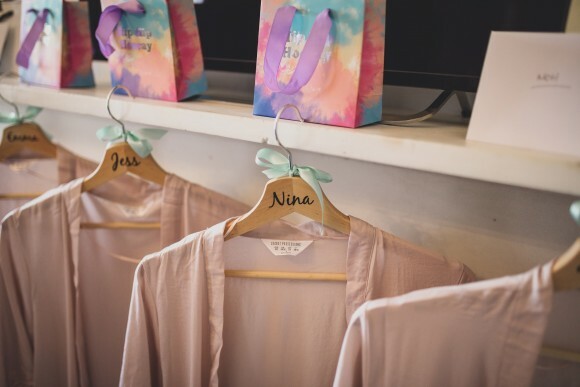 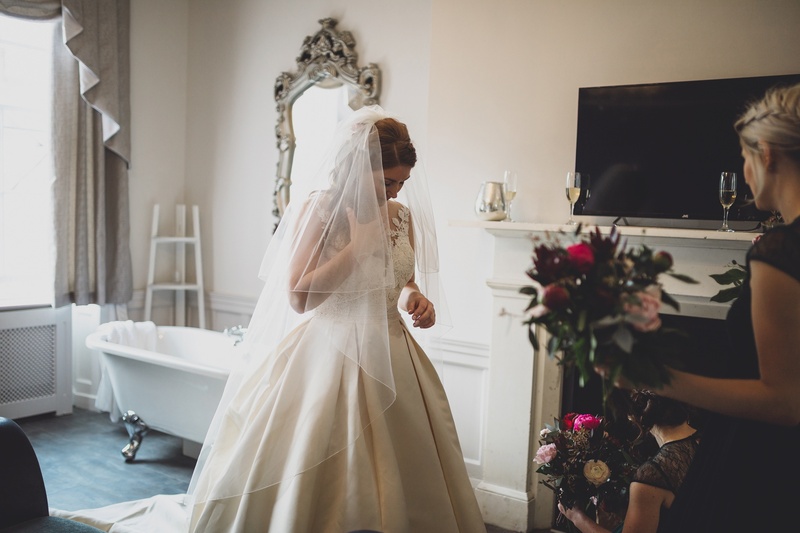 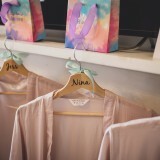 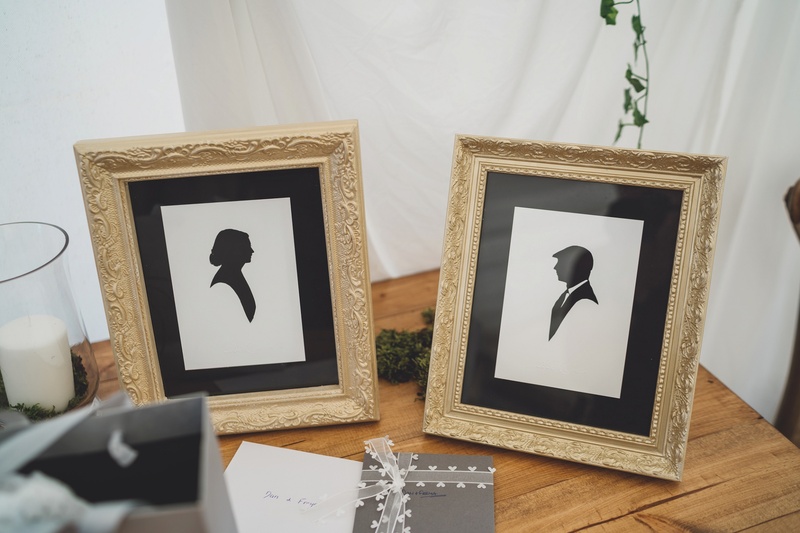 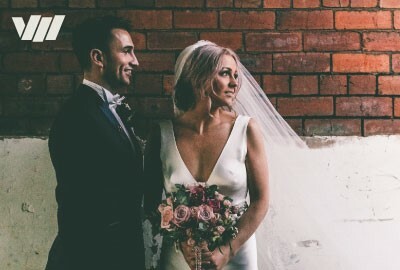 When it came to planning our wedding day, I totally checked out the Brides Up North website numerous times to get inspiration from real weddings and to find suppliers. 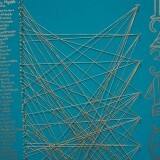 I love looking at what everyone else does for getting great ideas that work. 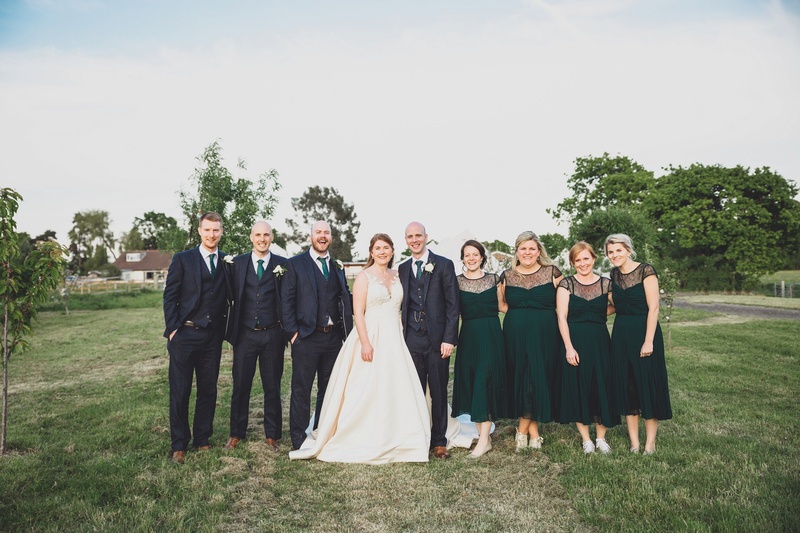 The theme took a while to develop but I got there after hours on Pinterest and then I found the bridesmaids’ dresses and it had to be green and gold for the colour scheme! 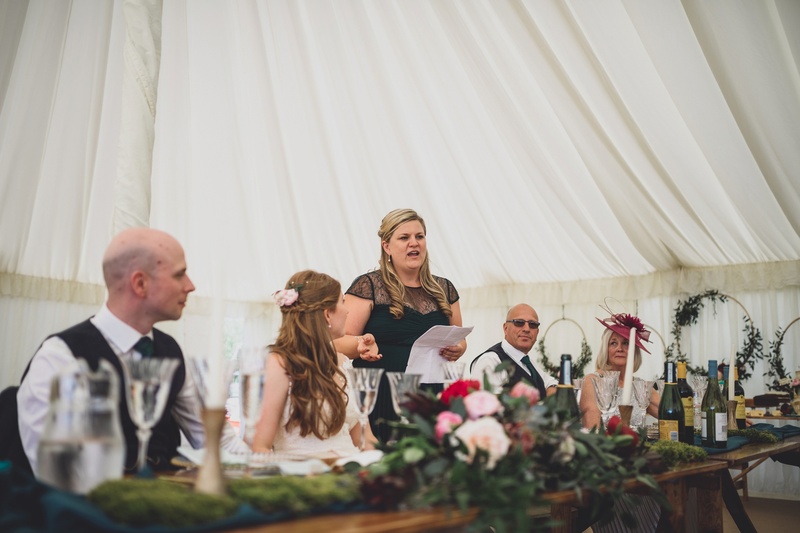 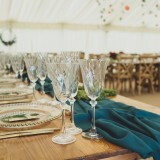 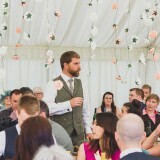 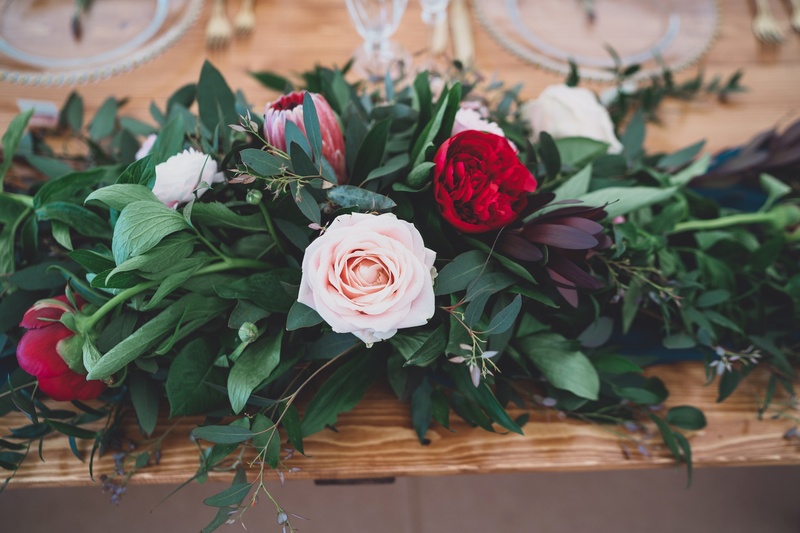 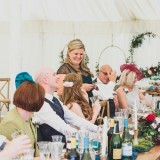 I wanted loads of flowers – not just on the tables, as I wanted to have interesting floral pieces with bursts of colour. 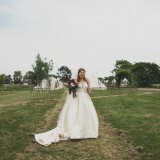 My dress was by Morilee. 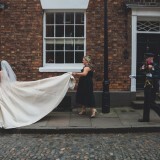 I knew as soon as a tried it on that it was one, after nearly 70 dresses! 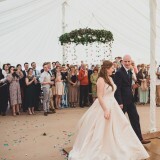 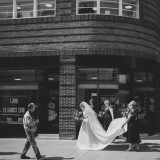 I went big: the dress was huge and I went for a light gold colour, which matched the theme perfectly. 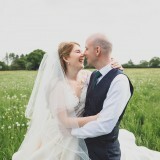 I bought the dress from a small independent store in Gloucester called By Design. 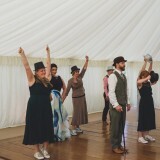 They were excellent. 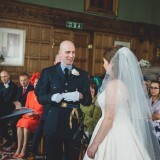 I felt like I was in safe hands and my dress fit perfectly on the day. 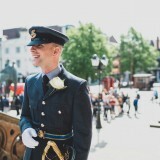 As Dan is a squadron leader in the RAF, he wore his uniform for the ceremony. 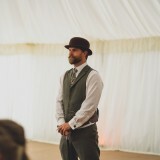 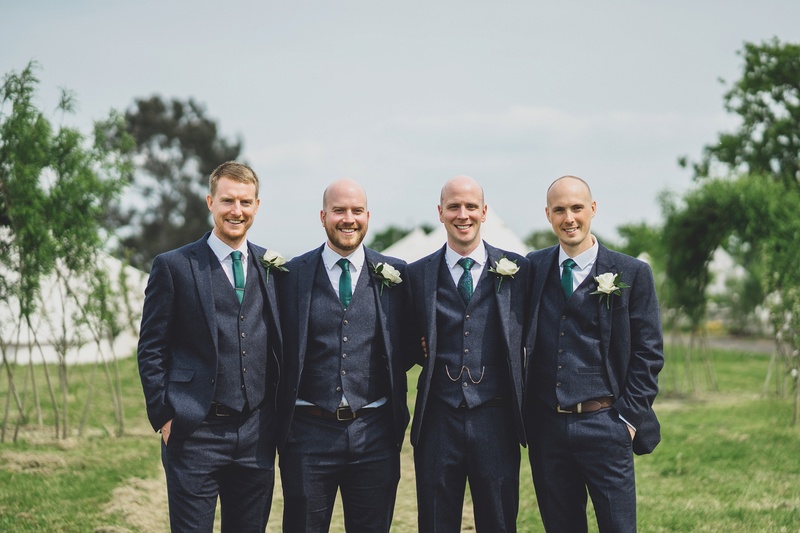 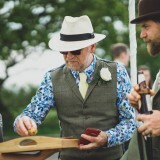 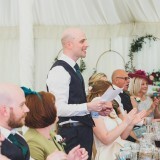 He changed before the meal into a three-piece suit in dark blue with a green tie from M&S, which matched the groomsmen. 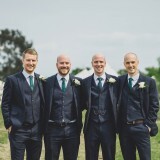 I think they may have been a touch warm in their wool suits, but they looked good. 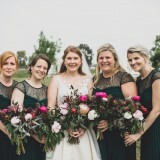 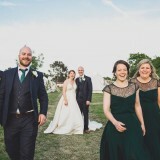 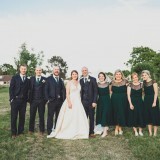 The bridesmaids all had the same dress from Coast in a beautiful dark forest green; it looked great on all of them. 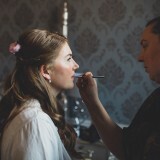 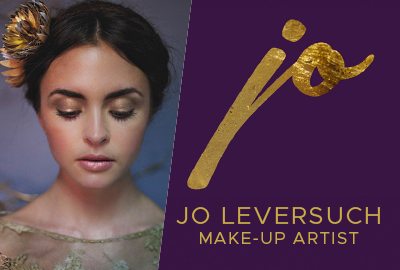 Our makeup artist was Louise Pennington. 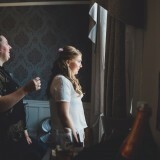 She was amazing and totally kept me calm in the morning. 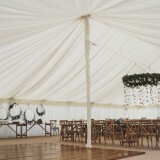 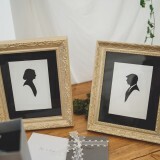 She was professional and relaxed – we were in safe hands and ready with loads of time to spare! 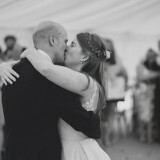 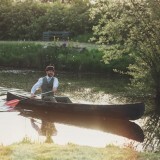 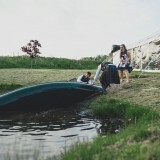 Our photographer was Jess Yarwood. 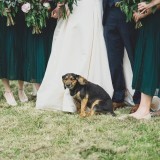 Jess was recommended by my brother and sister-in-law. 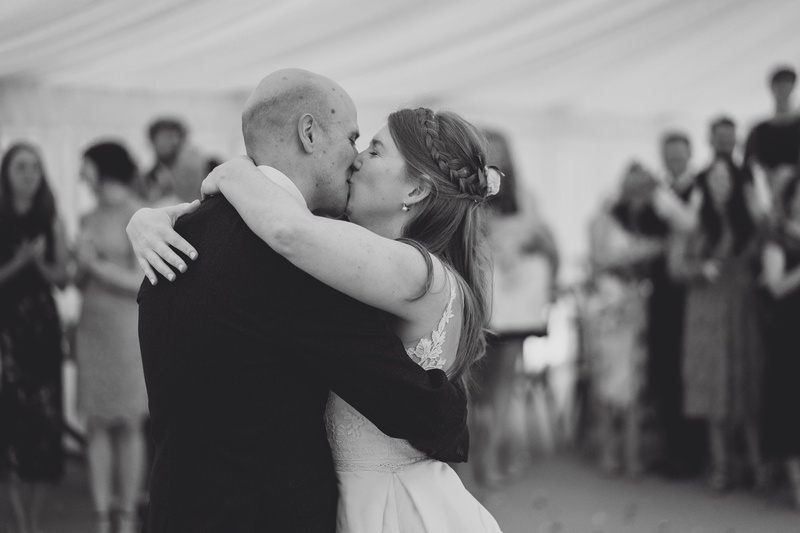 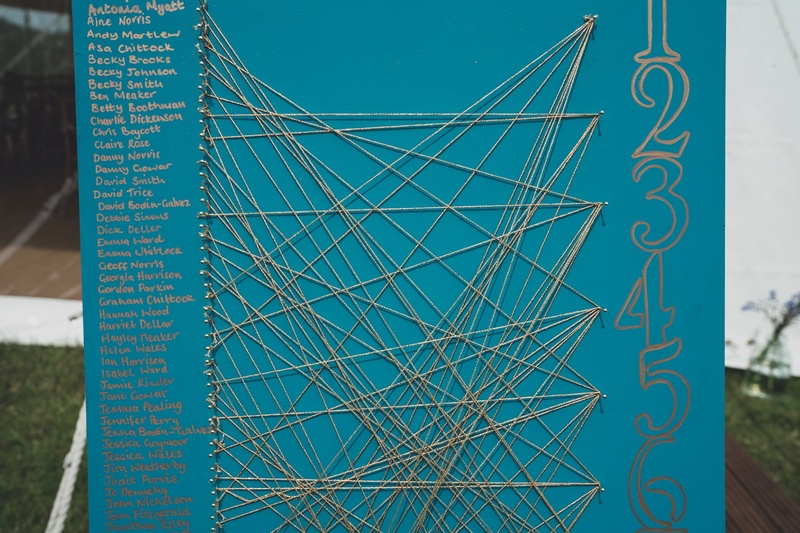 I loved her style; it is friendly and relaxed and she captures all the moments beautifully. 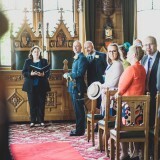 Our videographer was Mike Roberts. 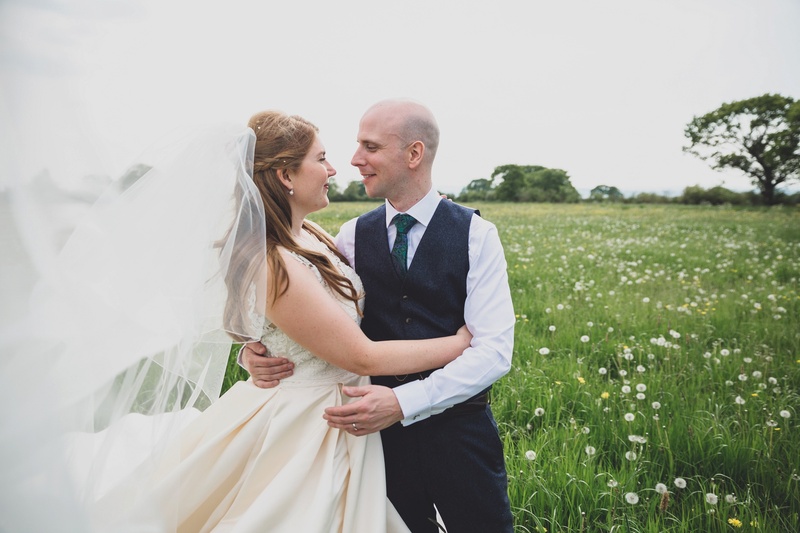 He was recommended by Jess Yarwood and, again, we could not have made a better choice. 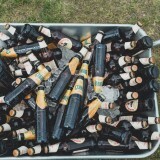 Mike came in the morning and has a way of putting everyone at ease. 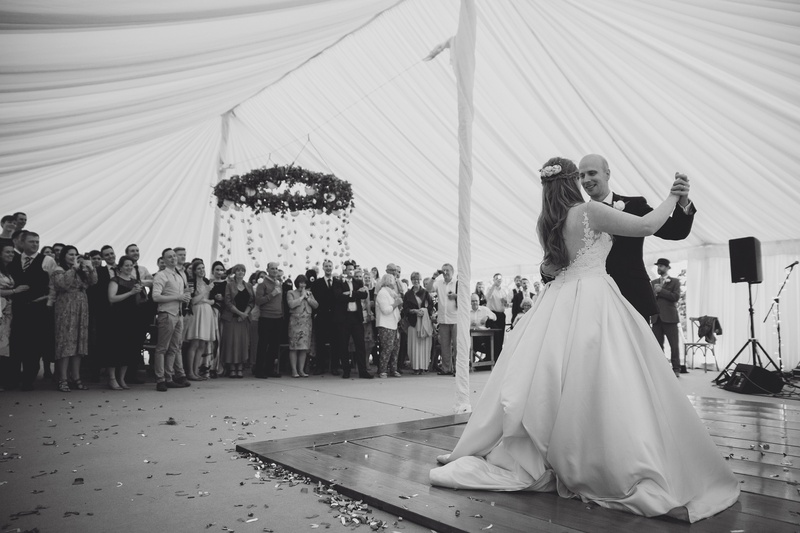 I’m so happy we decided to have the day filmed as it was over in a flash, so it will be fantastic to relive all the best moments again! 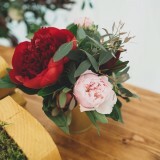 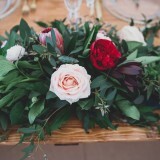 When it came to the flowers, I carried a bouquet of peonies and David Austin roses, with lots of greenery. 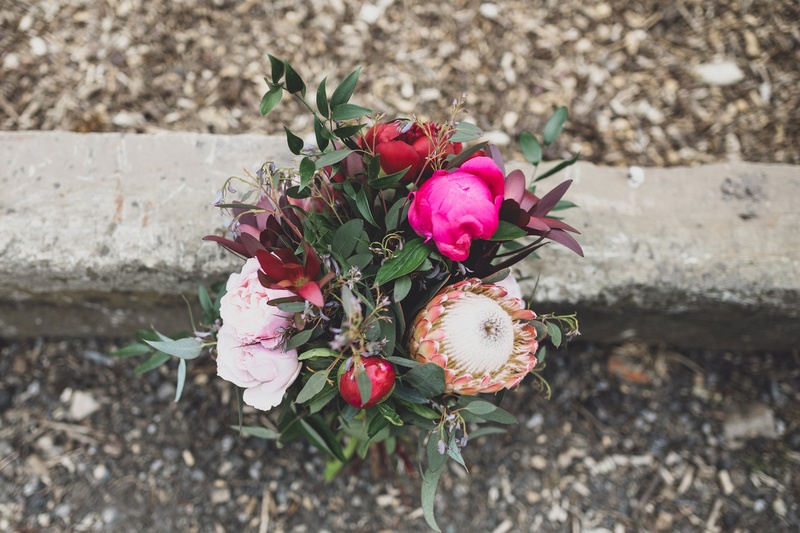 To give it something extra special, there was also a protea in there. 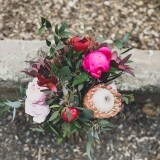 It was a loose bouquet of greens and pinks and was everything I wanted. 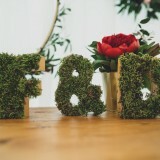 Jenny Baker from Lavender Blue Florist in West Kirby created our flowers. 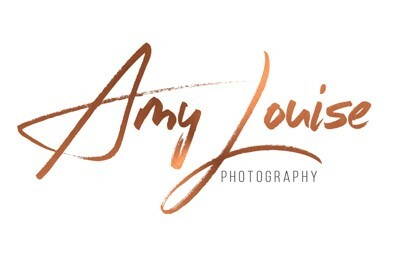 Jenny has so many amazing ideas and is very creative. 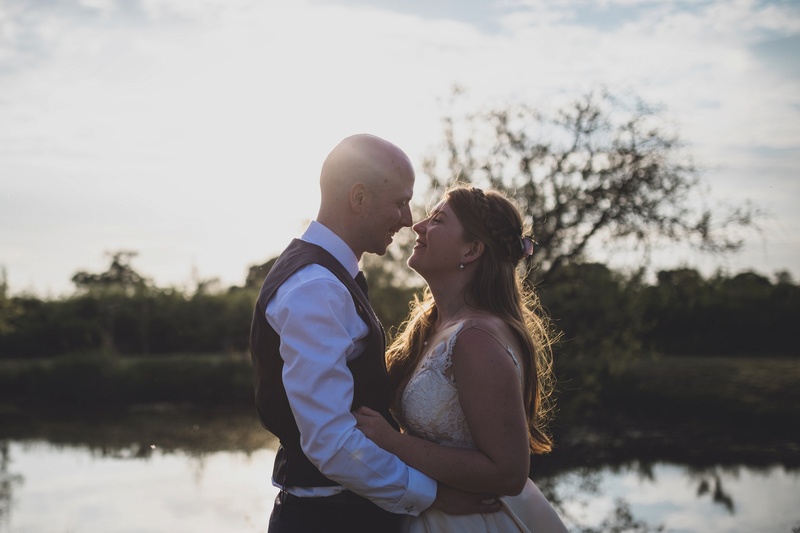 She took all my ideas and made them real; I couldn’t have asked for anything more. 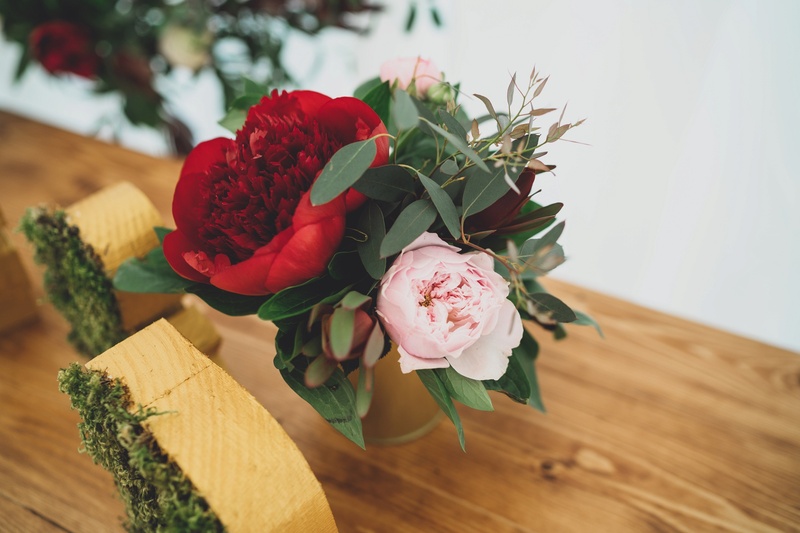 For the venue decoration, we continued with the same flowers in small gold pots on the tables and a low and loose arrangement for the top table. 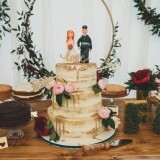 Over the cake table there were gold hoops decorated with flowers. 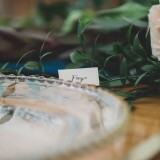 Jenny came the night before, so the first time I saw the reception flowers was on the day and it was breath-taking. 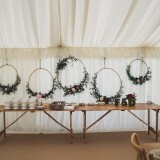 For other decoration, my now mother-in-law made two huge willow wheels. 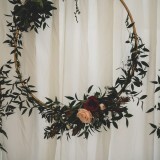 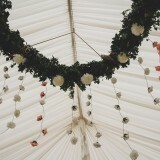 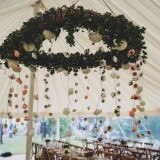 We had one as a flower chandelier centrepiece in the marquee and the other we used as a photo-booth. 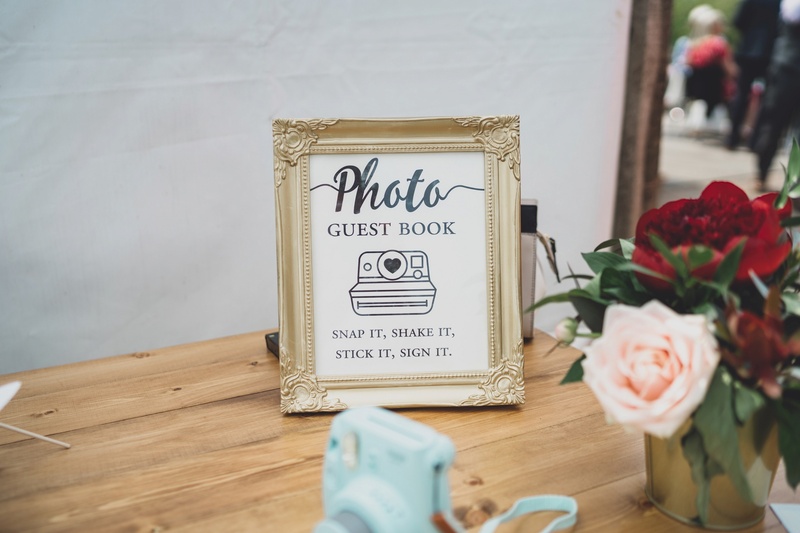 The pictures looked great in the Polaroid photo guestbooks. 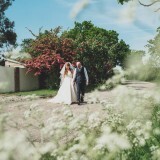 For favours, we gave out a packet of wildflower seeds. 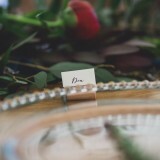 We had a personalised stamp made, so it took some man-hours to get them ready but they looked fab. 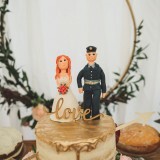 The cake was made by Gaynor at Kings Acre Cupcakes. 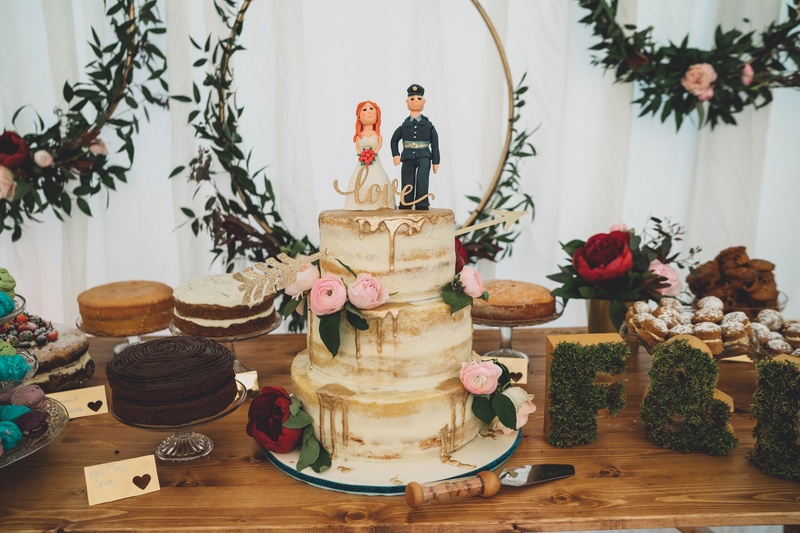 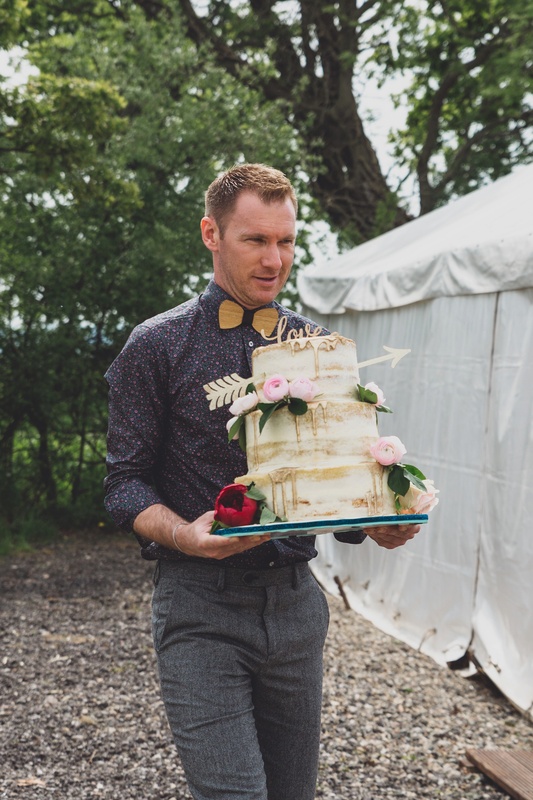 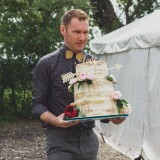 I had seen a semi-naked cake dripping with gold on Pinterest and Gaynor’s version looked amazing and tasted even better. 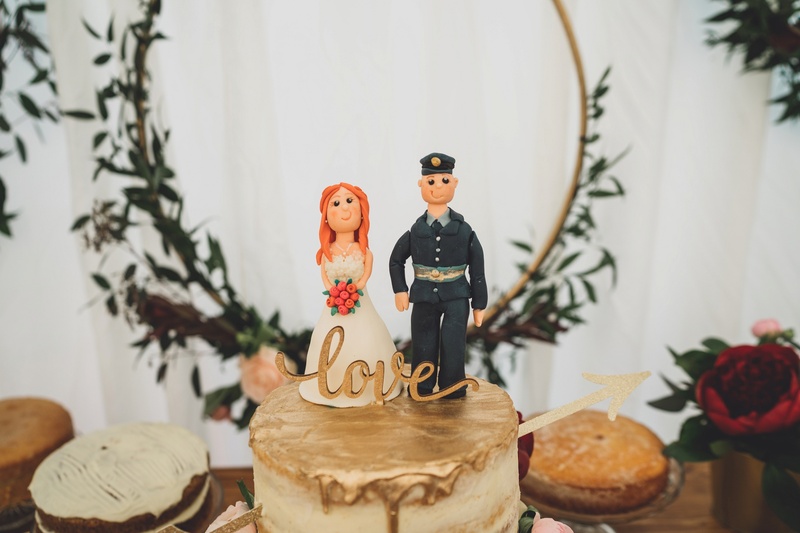 My mum also made a miniature Dan and me for the cake topper, which was a great touch. 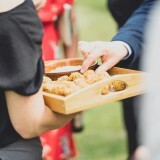 When it came to the meal, we wanted to make sure there was a lot of great and tasty food. 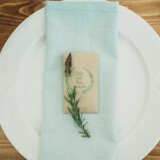 We chose to go with Thyme Outside from Didsbury. 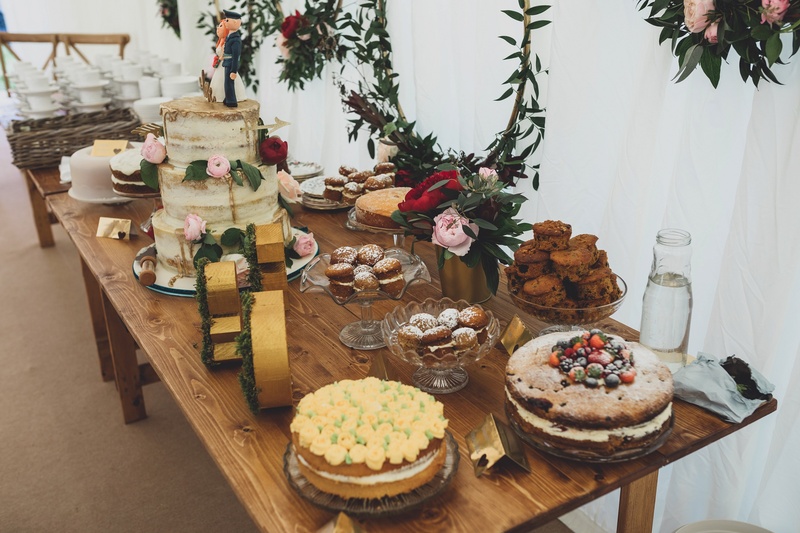 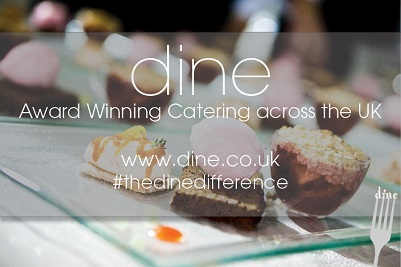 We visited their restaurant when we first started dating so, when we found out they did outside catering, it was a no brainer. 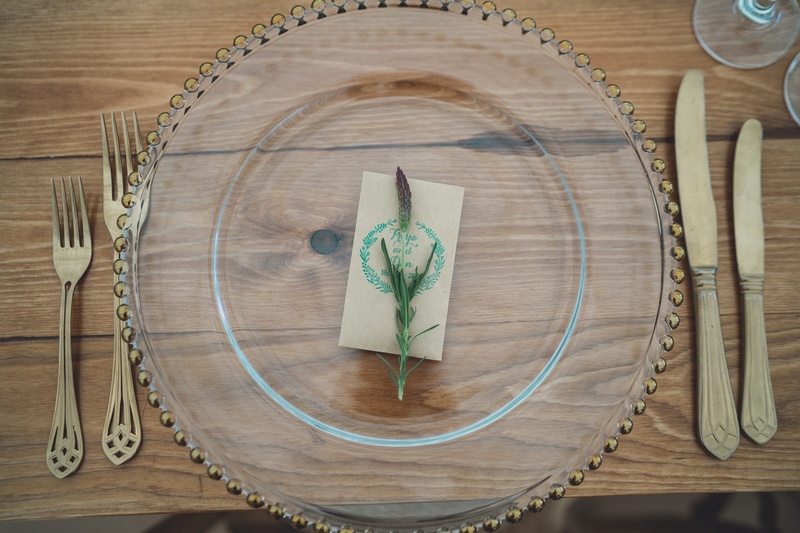 We had a family-style main course of beef and slowly braised lamb. 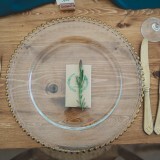 It tasted beautiful and, with all the trimmings, no one was left hungry. 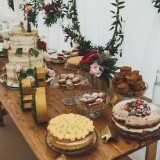 For dessert, we had a cake table; mine and Dan’s mums and aunties made loads of beautiful desserts. 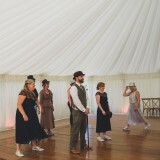 For entertainment, we had a band called Mulder & Co that we had seen at a friend’s wedding the year before. 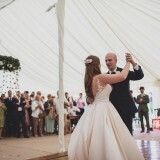 They were great and had the dancefloor packed all night. 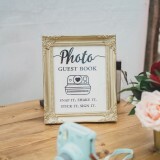 For special touches, the Polaroid photobooth worked amazingly. 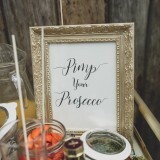 The ‘pimp your prosecco’ station also went down well. 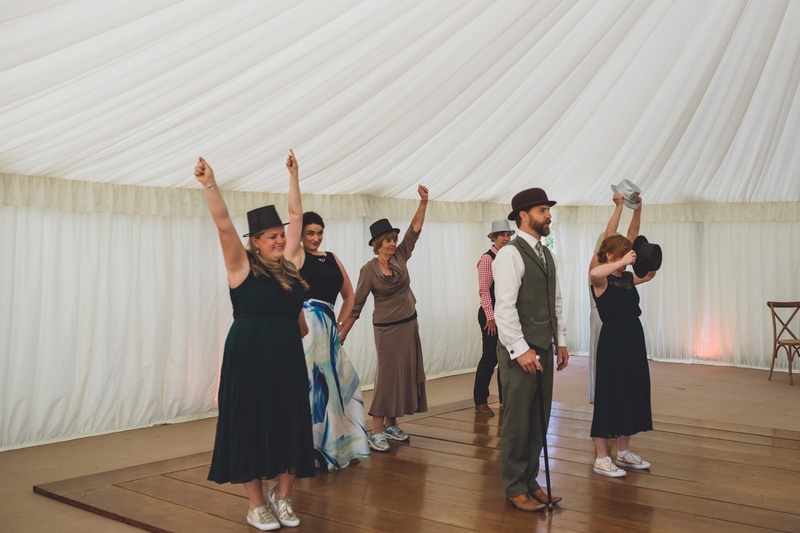 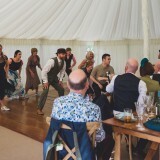 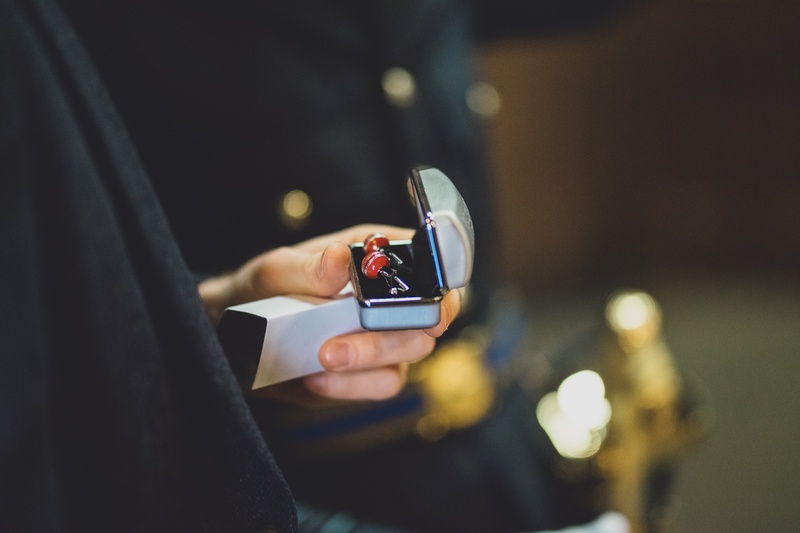 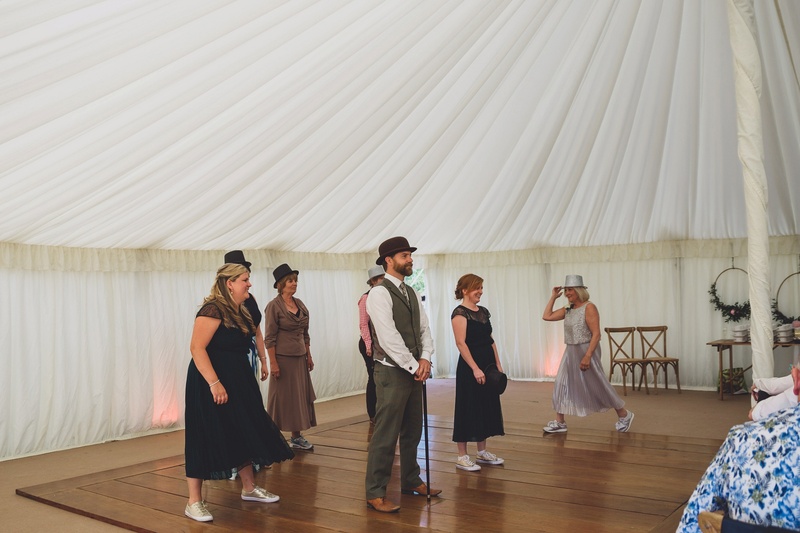 The highlight of the special touches was the Greatest Showman flashmob that some of my friends and family surprised us with, so I guess our wedding had secret theme! 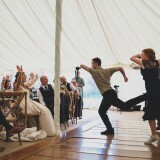 It was incredible; I can’t believe they were all practising for months and we had no clue. 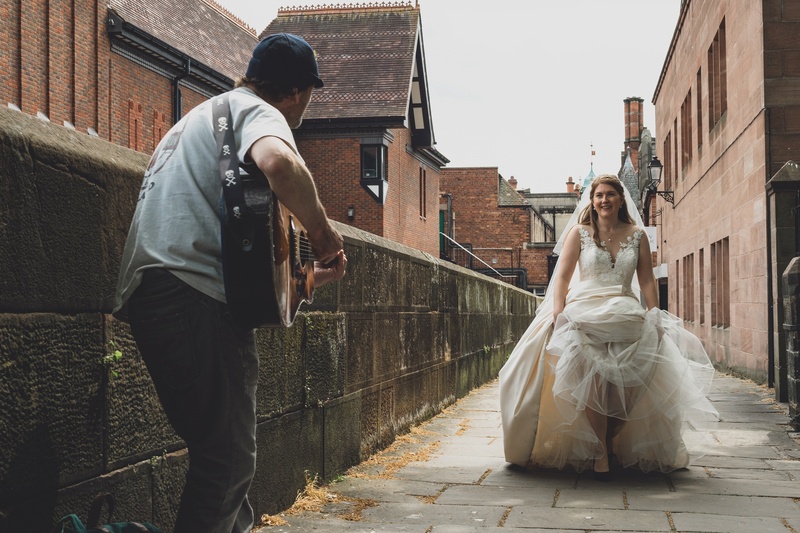 We have all been slightly obsessed with the movie since it came out, so this was a wonderful surprise. 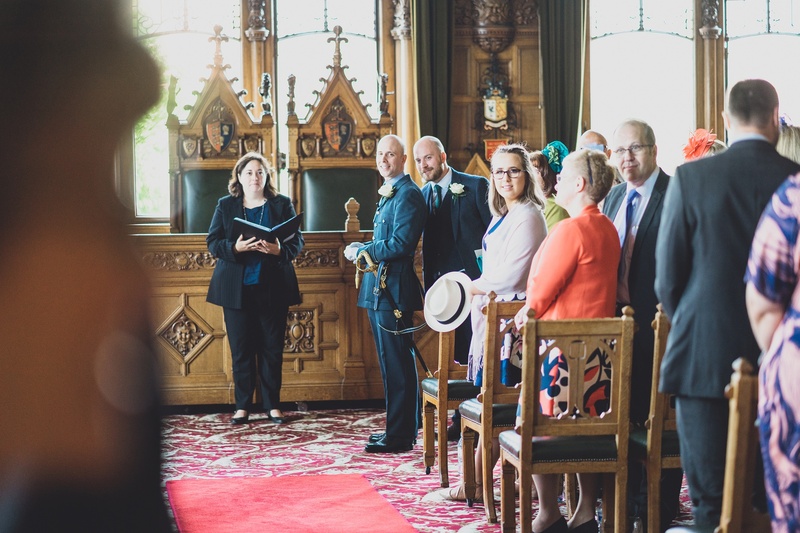 My favourite part of the day was walking down the aisle to Dan; although I was unbelievably nervous and cried the whole way, it was a beautiful moment. 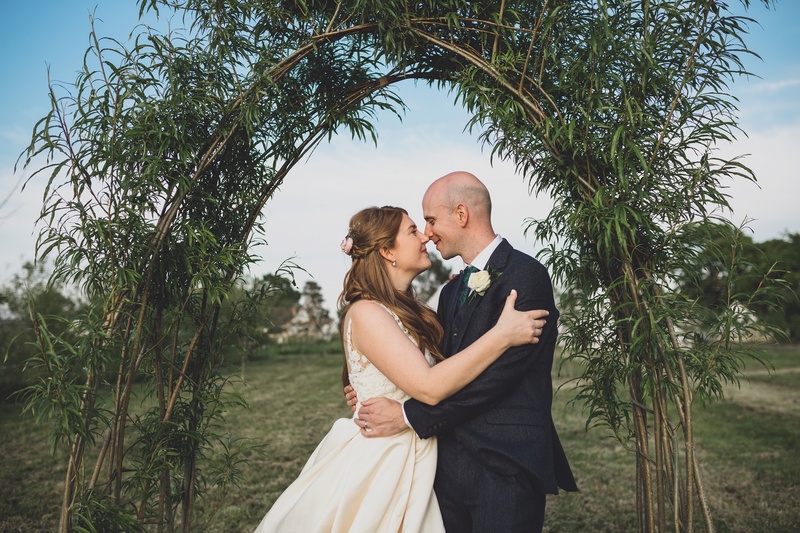 Saying our vows to each other was more incredible than I could have imagined. 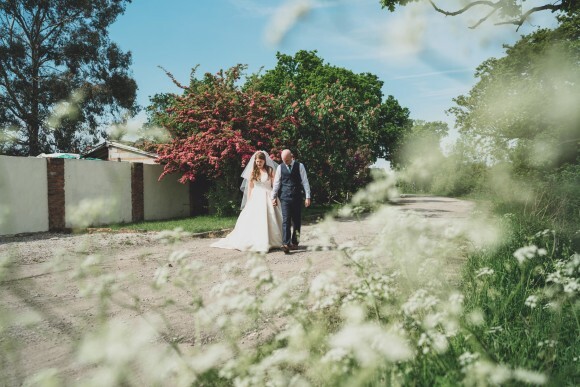 For our honeymoon, we spent two weeks travelling in California down Route 1 in a campervan. 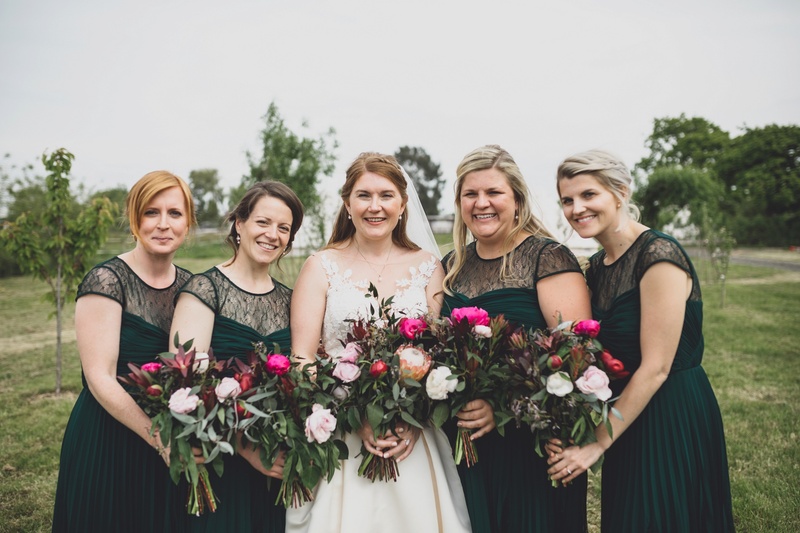 We flew into San Francisco, where we spent a couple of days sightseeing and then off we went on our adventure on the open road, where we saw the most amazing scenery. 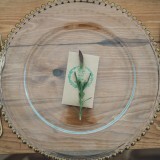 We headed over to Yosemite for a bit of hiking and then over to Monterey for whale watching. 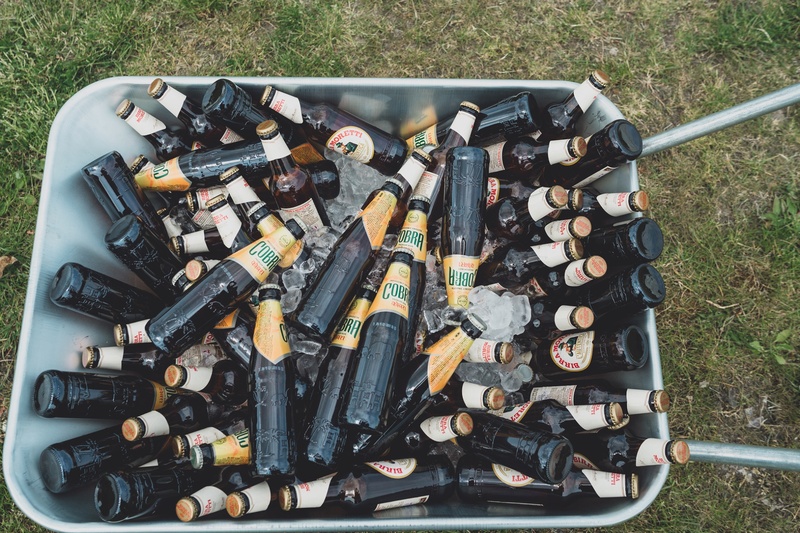 We also headed down to LA for a fun-filled day at Universal Studios and to experience a game of American baseball at Dodger Stadium. 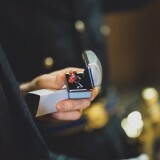 Then it was off to Vegas and, to top it all off, we had a helicopter ride over the Grand Canyon. 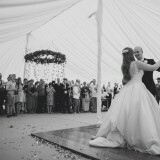 It was two weeks that went too quickly! 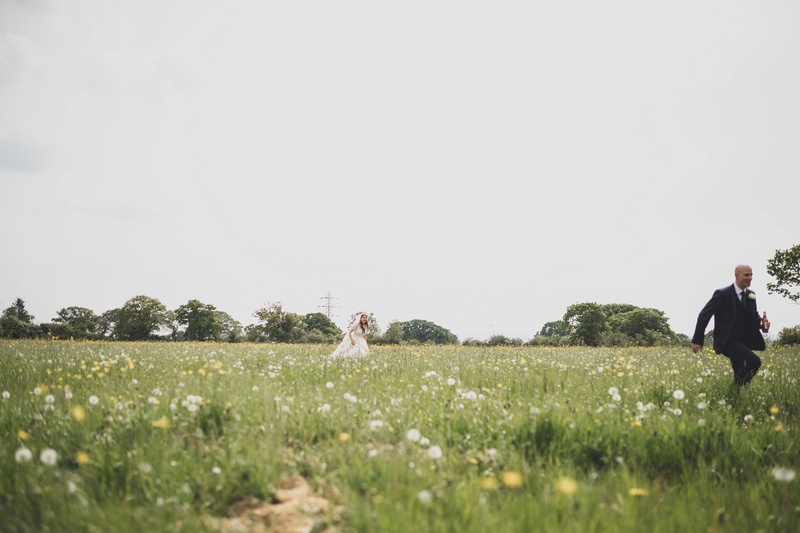 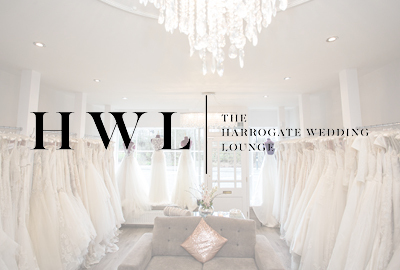 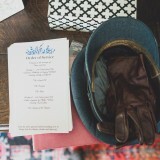 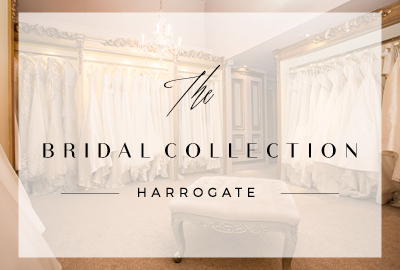 My top tip for other Brides Up North is to go for what you want, as your vision will work no matter how crazy it is! 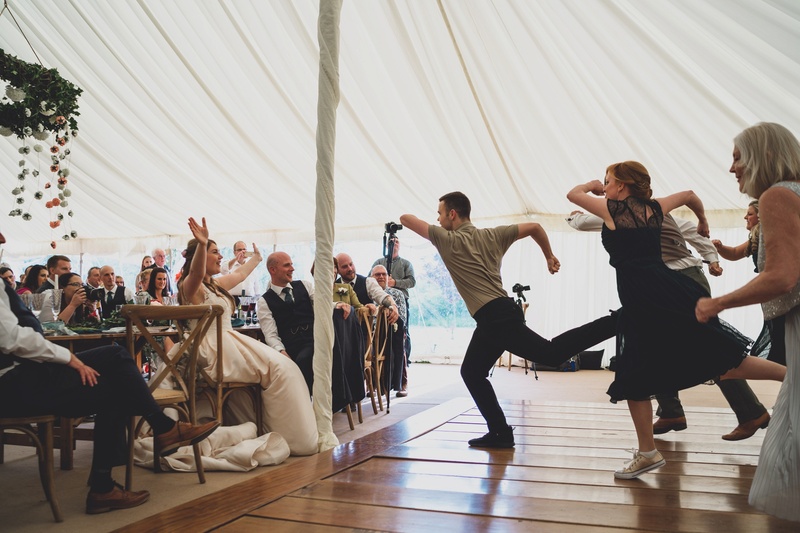 Also, I wish I had done what everyone told me and Dan to do – take ten minutes to ourselves. 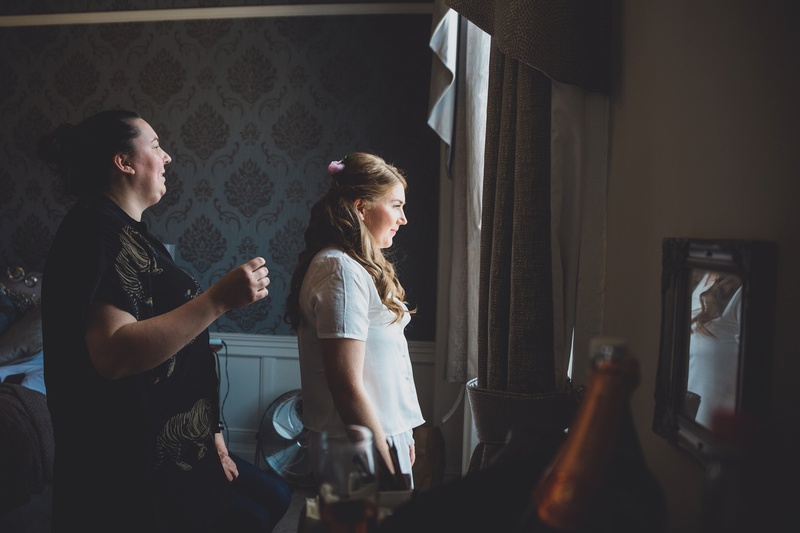 The day goes so quickly, and you barely get a chance to be alone and look at everyone who is there to make your day so special.